This past Saturday evening we decided to go to Victoria, a small town nestled deep in the heart of central Virginia, about an hour’s drive from our farm. It was a spur of the moment decision. Gene came in from feeding the cows and asked if I wanted to go. He had heard about a country bluegrass group singing at Victoria Restaurant that evening on WSVS, a small town station located in Crewe at 800 AM that plays country and bluegrass music. The afternoon DJ each day is Bobby Wilcox from our hometown of Powhatan. 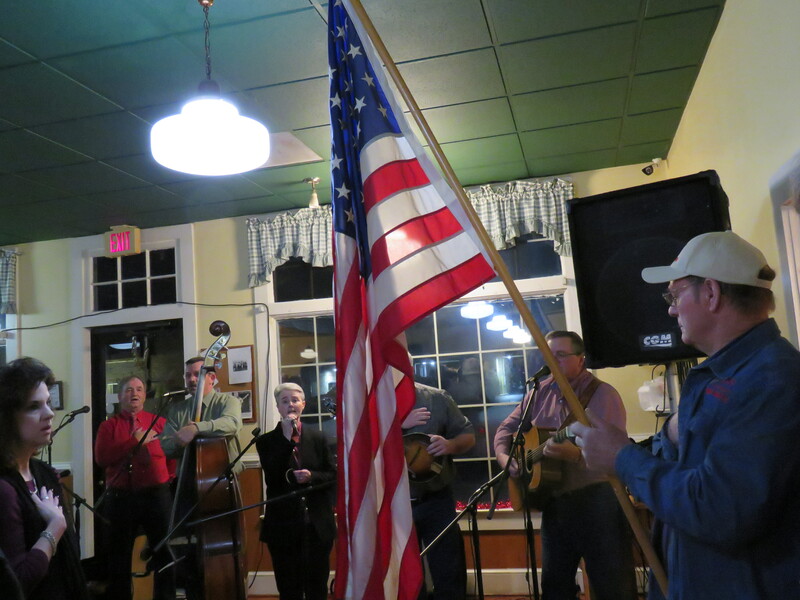 It was a cold, dreary, rainy evening but what we found in small town USA was a warm and welcoming reception. We arrived one hour early thinking we had plenty of time for the buffet supper. Actually we were about the last to arrive and most had already eaten. We didn’t realize we needed to make reservations but we were welcomed in with the assurance that they would find us a spot in the already packed room. They first found us a table in the side room where the musicians were eating and preparing for their performance, to eat our supper. The buffet was a true southern feast: fried chicken, meatloaf, mash potatoes and gravy, sweet potatoes, green beans, white navy beans, macaroni and cheese, hot homemade rolls, banana pudding, and blackberry cobbler. The musician in charge of the group interacted with us, asking where we were from and what brought us to the event. When he discovered we were from Powhatan, he made the instant connection to Bobby Wilcox and mentioned that he was in house that evening. It was obvious that Bobby was a well-known and loved radio celebrity in that part of the country! 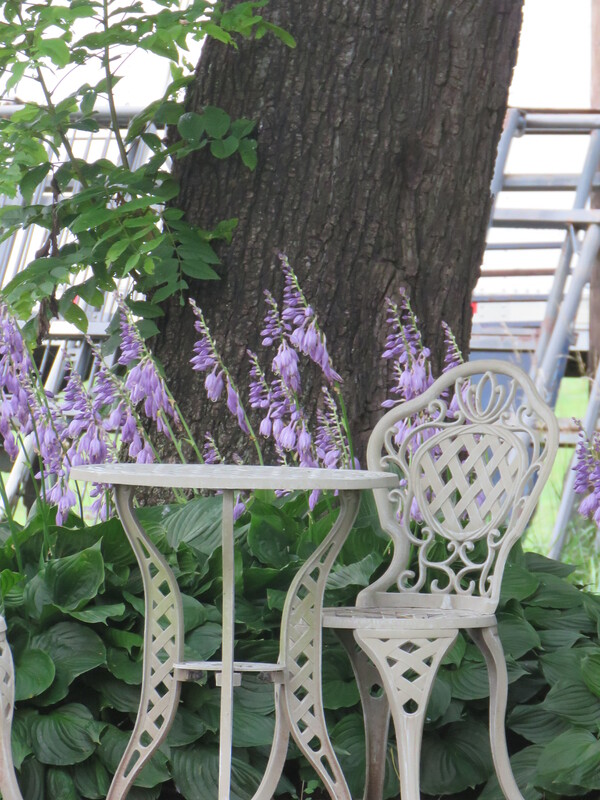 He went and found us a spot to sit…. at Bobby Wilcox’s reserved table. 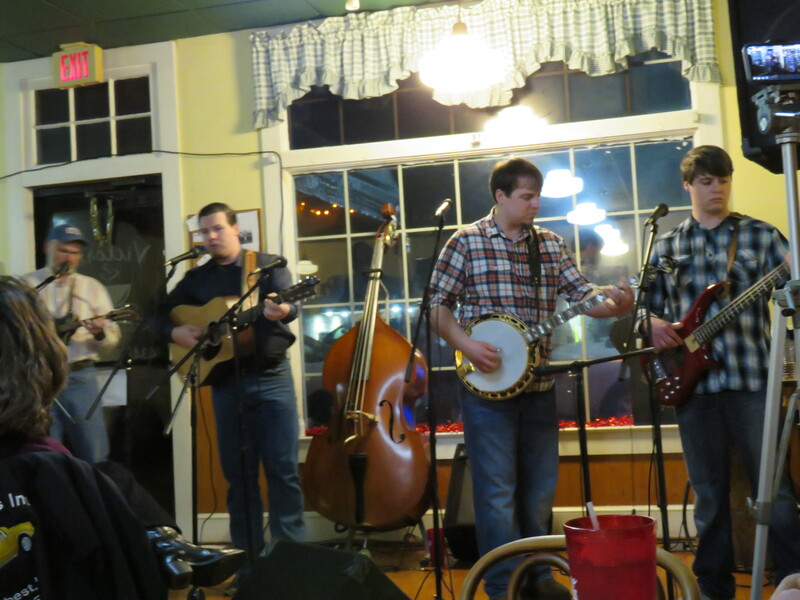 The opening band was “First Time Around”, a local group who sang country gospel music for one hour. They did an excellent job and were very open in sharing their faith through testimony and singing. 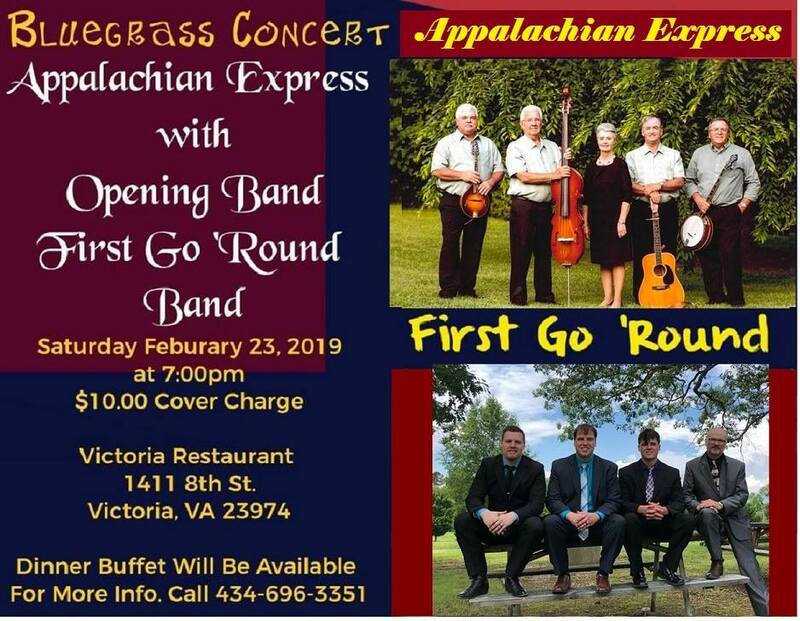 The feature group was “Appalachian Express”, a well-known country bluegrass group with a list of credentials and awards to fill a book. They entertained us well for almost two hours. I snapped this picture just before the veteran removed his hat and handed it to his wife. It was a special evening and as we traveled home we talked about the evening. Not one person used the venue to mention politics, speak an unkind or vile word, make a crude or belittling insult towards any person or group. No one stomped on the flag. In fact, it was quite the opposite. 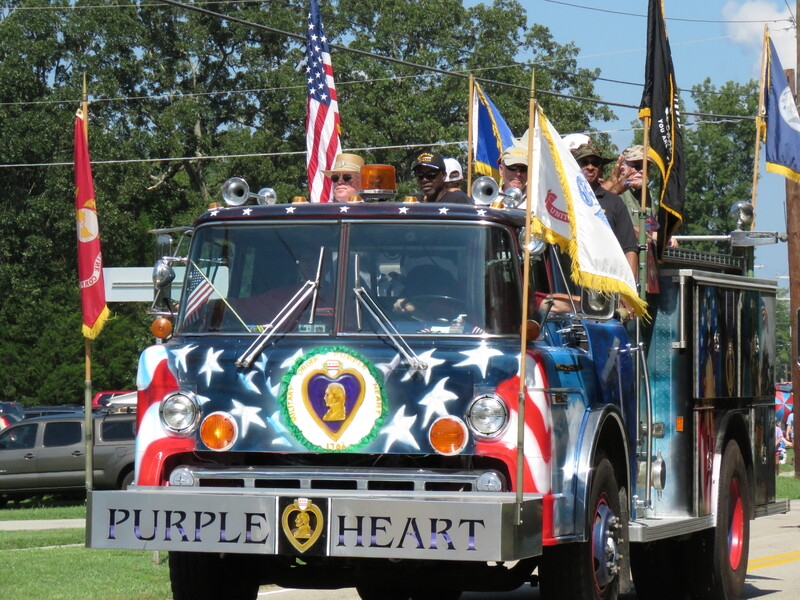 There was respect for the flag and honor for our veterans who gave so much for our freedom. There was love for our country with no resisters or jeers of protest. And most of all, faith in God was openly expressed without shame or fear. God’s redeeming love was proclaimed and no one was threatened with hate. 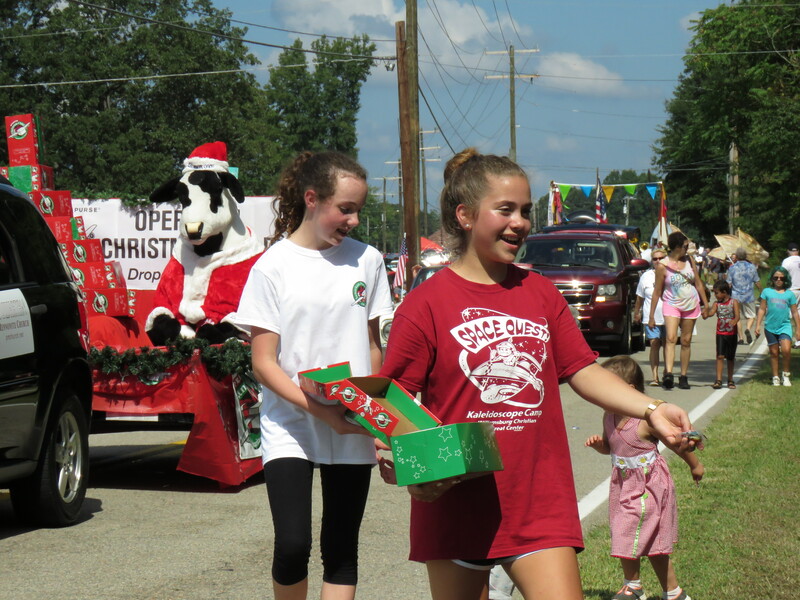 Rural hometown USA is different than how the media portrays in the news. This was “God and country” territory; the America we know, love and cherish. A little bit about Victoria Restaurant….. They are located in the heart of a little city with 17 streets. They are located 1411 8th St. Victoria, VA 23974. 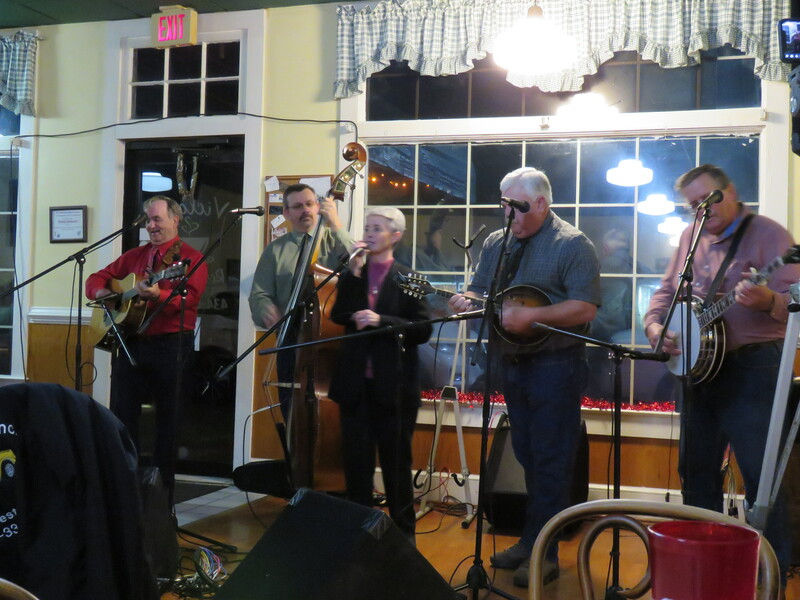 On Friday evenings, locals play and sing as you dine and there is no charge for the entertainment. On Saturday evenings, they have scheduled groups and there is a $10 per person fee plus the food. They also have a facebook page where you can follow their schedule of events. 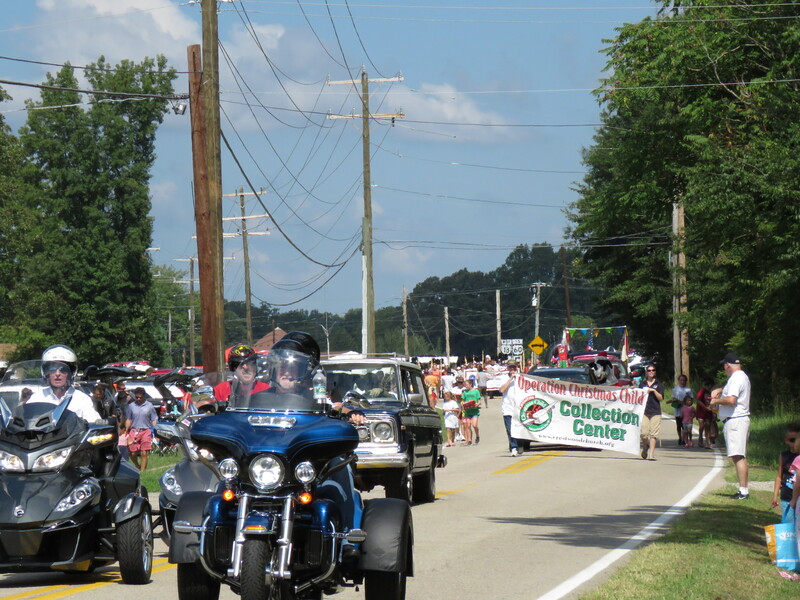 The Powhatan County Labor Day Parade….Powhatan patriotism and community unity at its best. 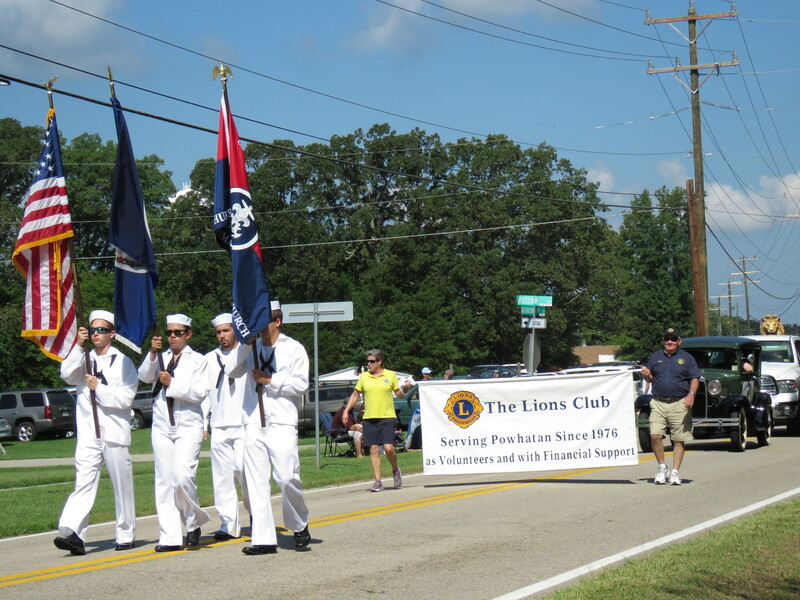 11 a.m. sharp….Siren’s wail announces the start of the parade. 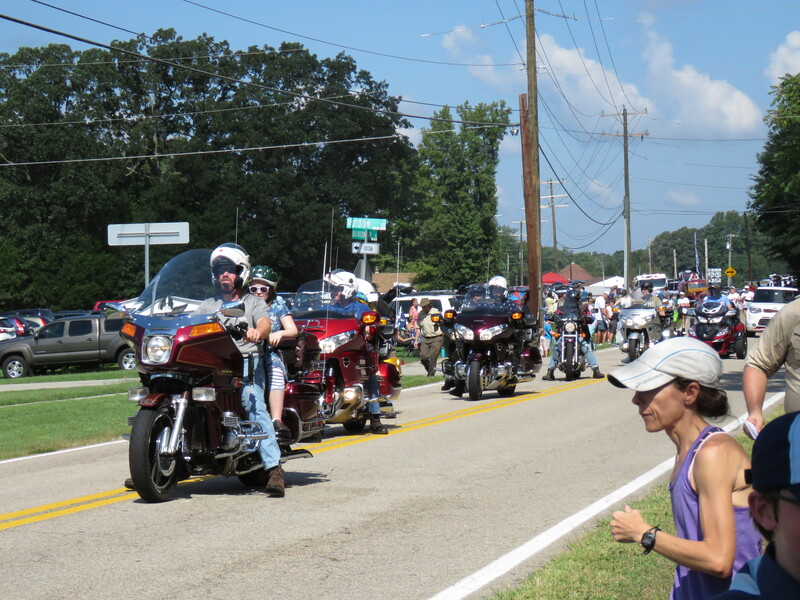 Honks blowing, sirens shrieking, motors reviving, cycle rumblings, bands marching, hands waving, neighbors chatting and candy throwing…. 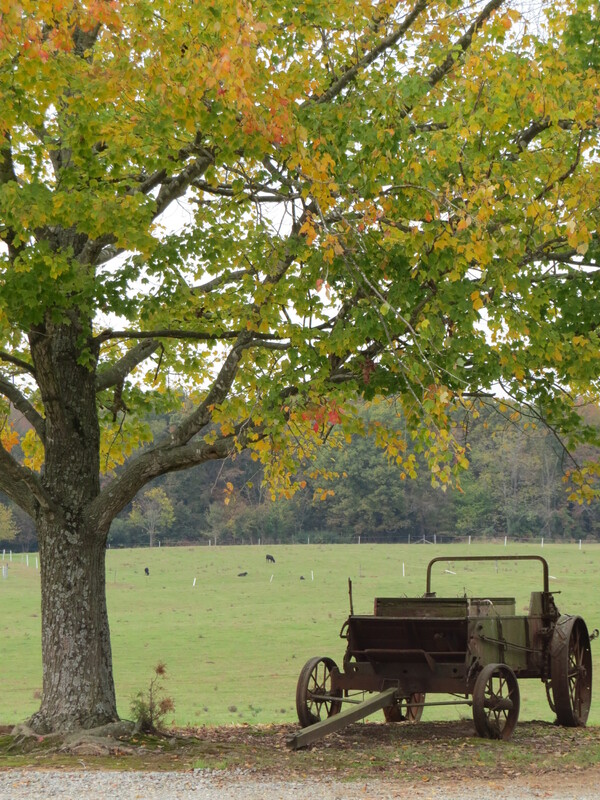 Powhatan County spirit in full display….the modern, the antique, the young and the older! 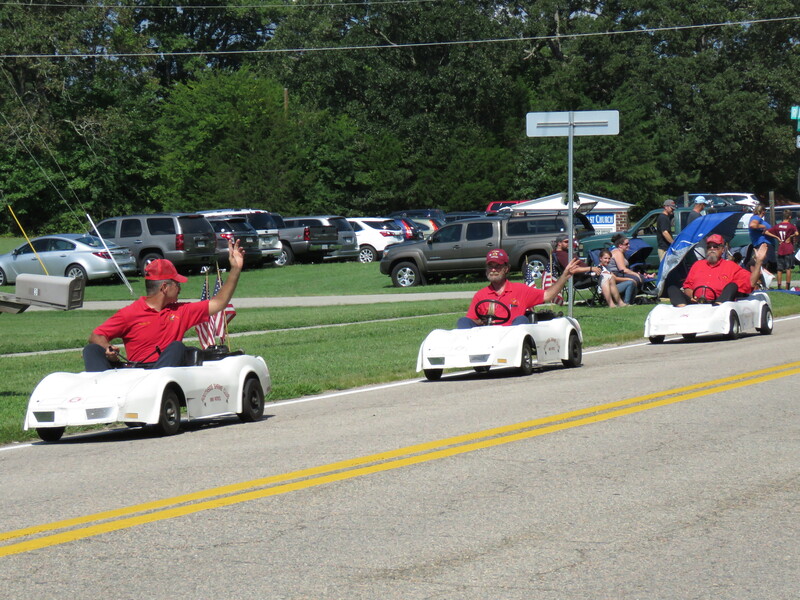 These guys had a blast doing doughnut circles all over the road. 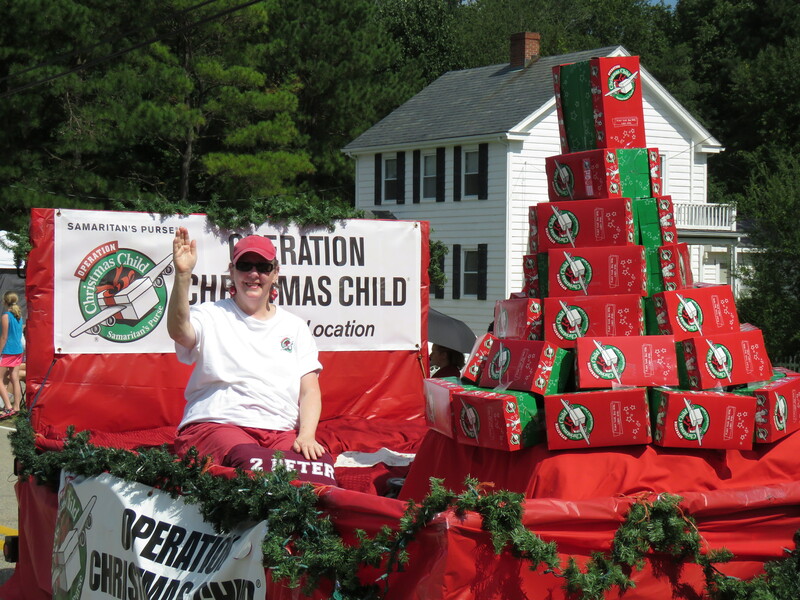 Powhatan Mennonite Church float featured Operation Christmas Child Shoe Boxes. 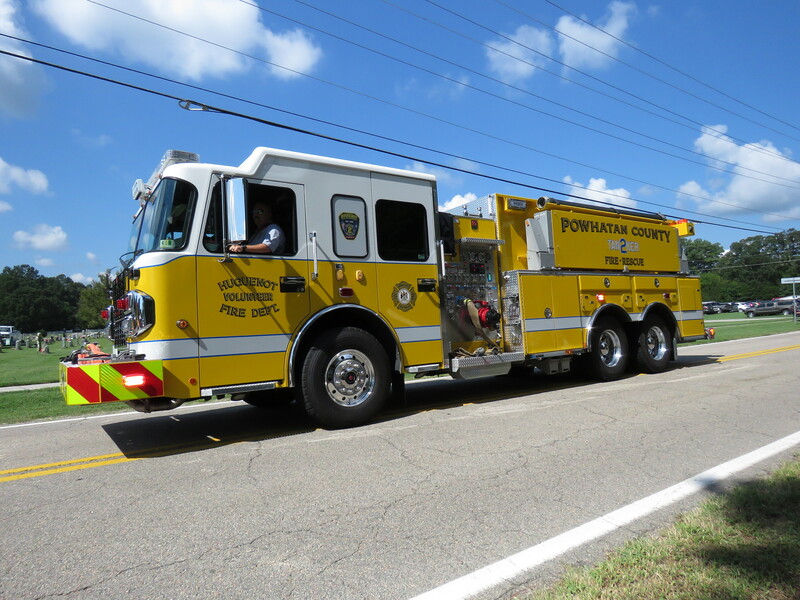 Our church is the drop-off location for Powhatan County. 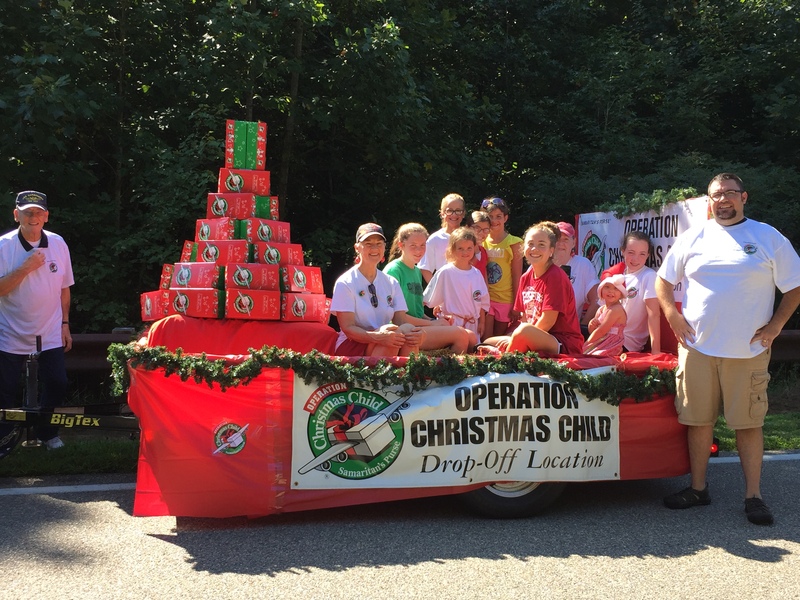 It is almost time to start think about filling shoe boxes again. 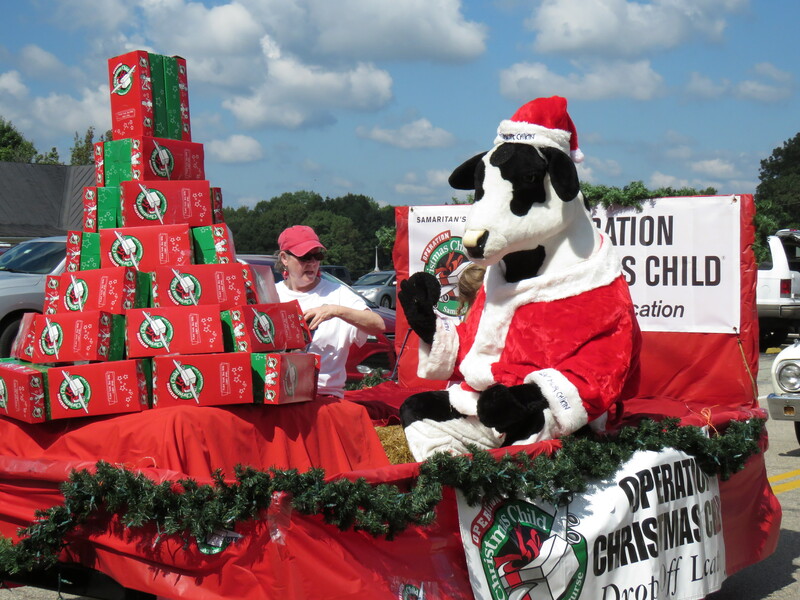 You may get instructions on how to participate at the Samaritans Purse website or call the church (804-598-3365) to pickup empty shoe boxes and labels. Information will also be on our church website (www.pmchurch.net) very soon. 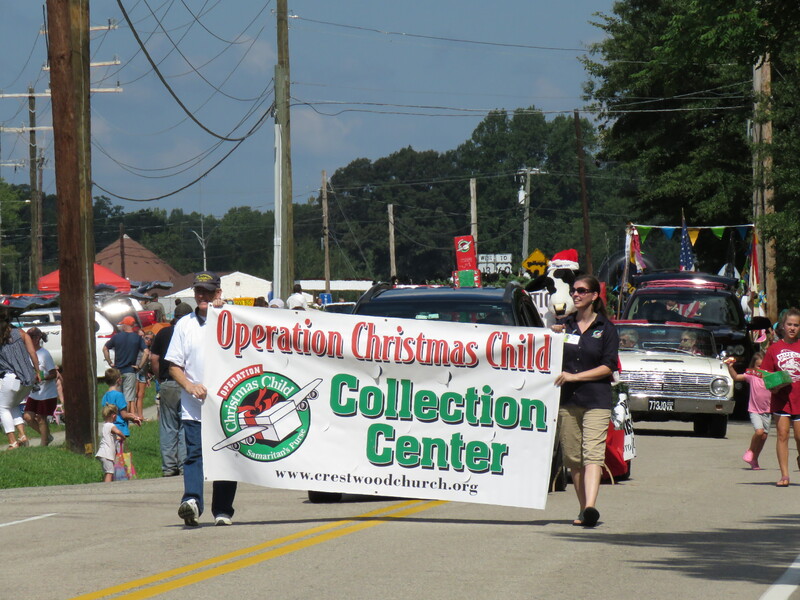 Collection week will be November 12-19, 2018. 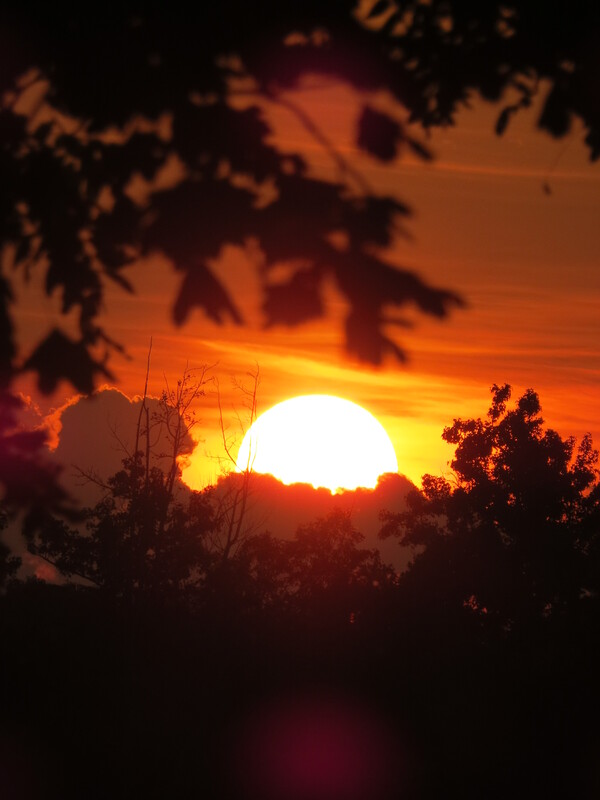 A glimpse of my summer through the lens of my camera. 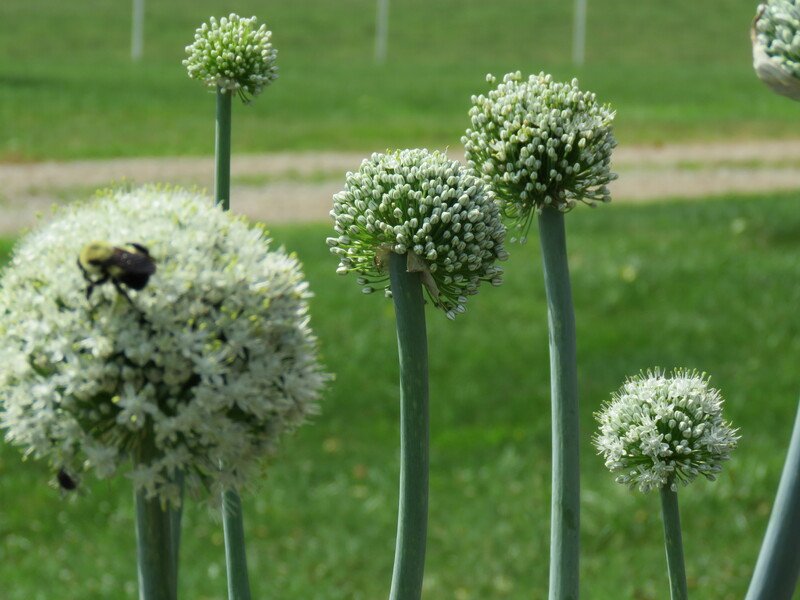 Onions that went to seed. 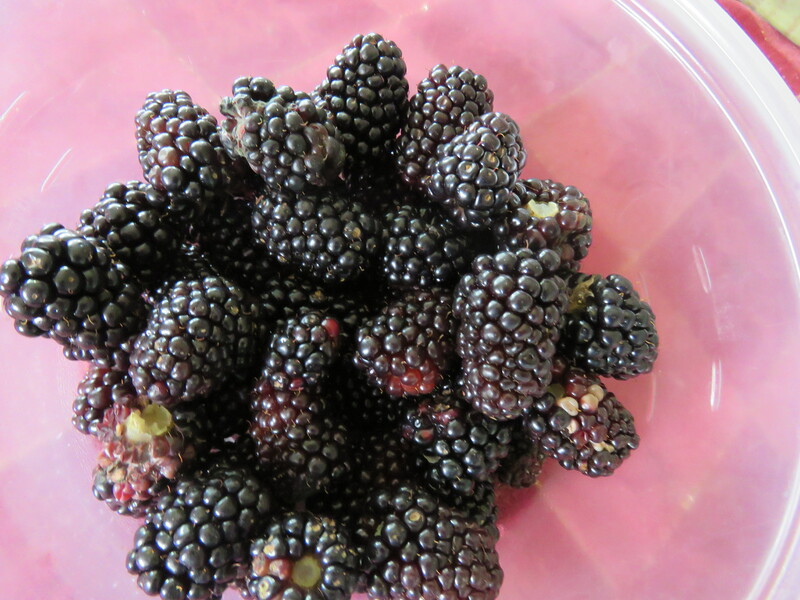 Fresh blackberries from my garden. Just chillin’ on a hot day. It is called bearding. 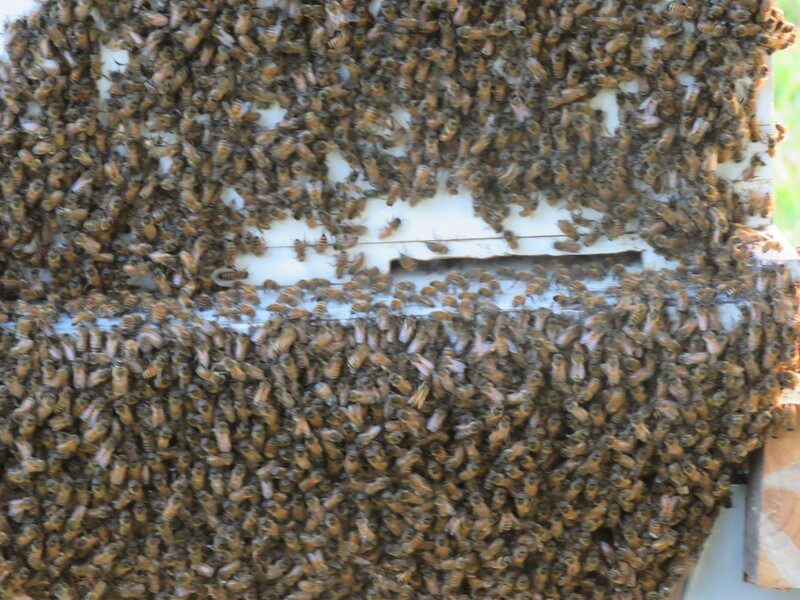 Hundreds of humming, buzzing bees sitting on their porch! 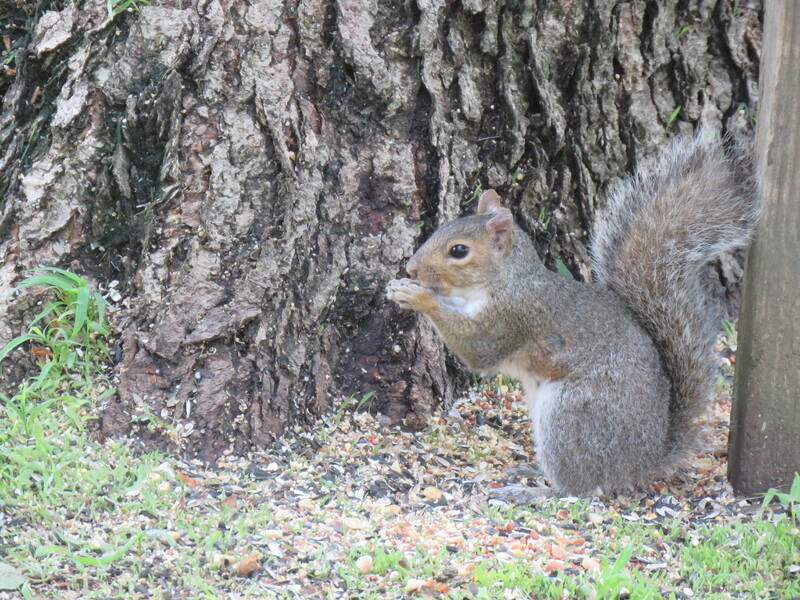 A frequent visitor to my bird feeder. 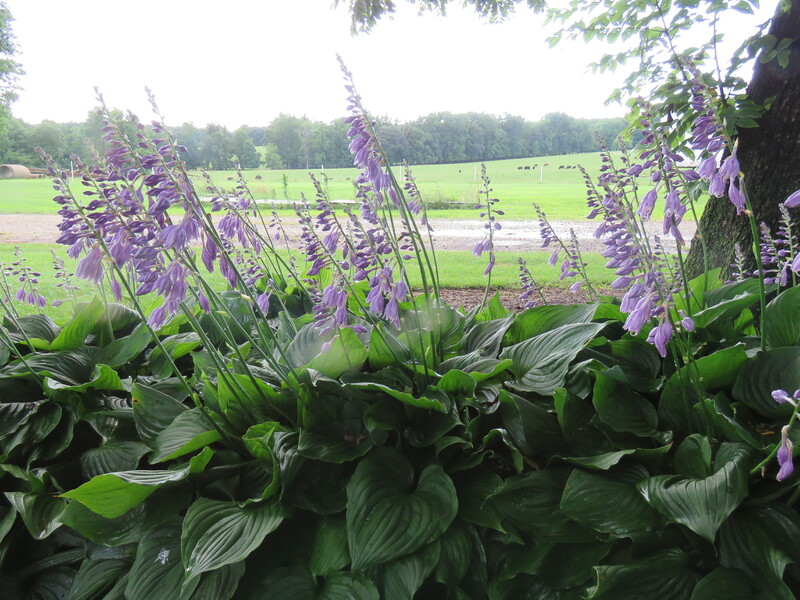 I love when my hostas bloom. Buzzard in a dead tree. Settling in for the night. 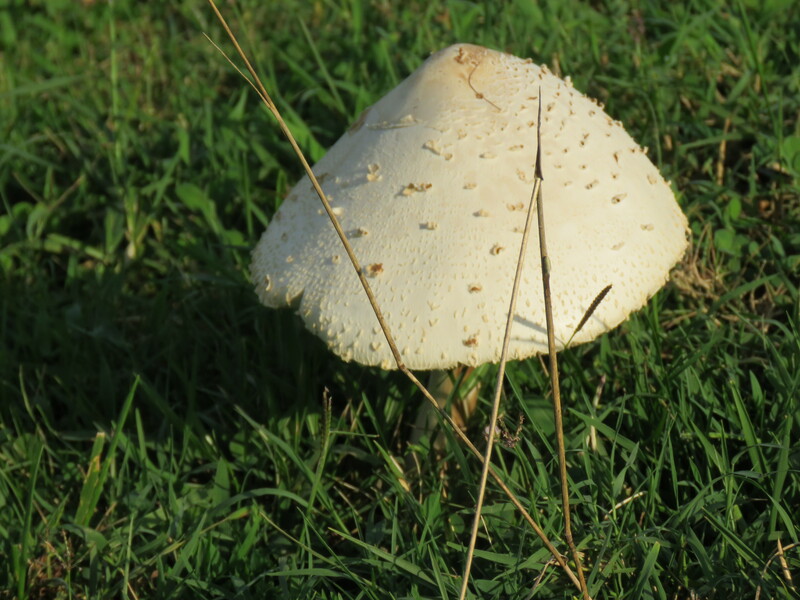 Huge mushroom from all the wet weather. 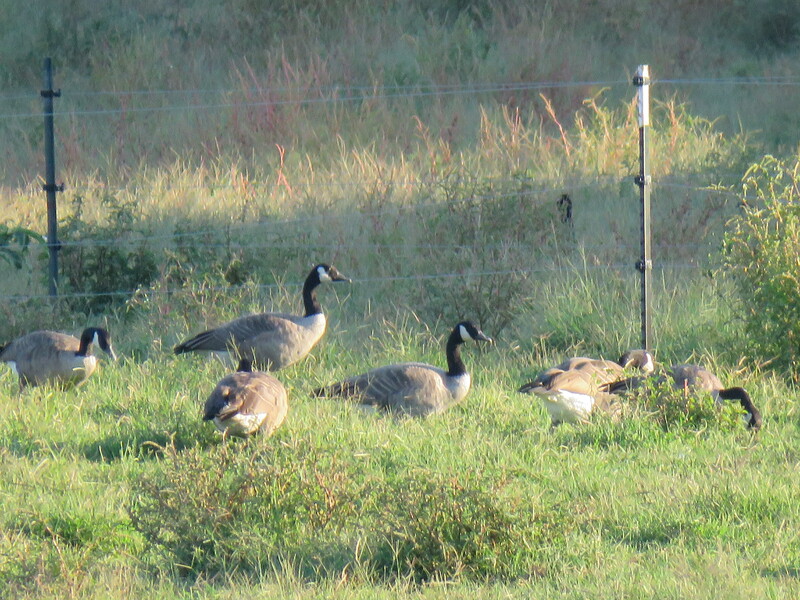 Wild Canadian geese grazing in the pasture. 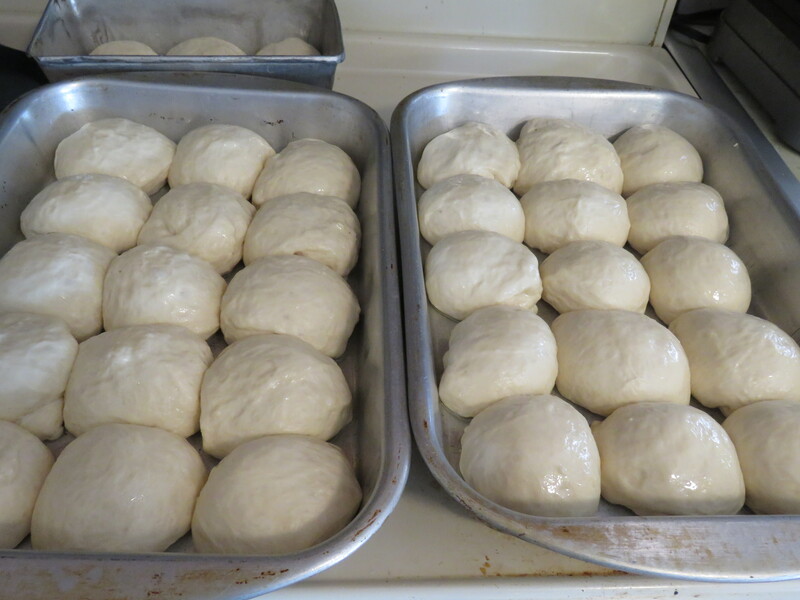 Homemade rolls almost ready to bake. 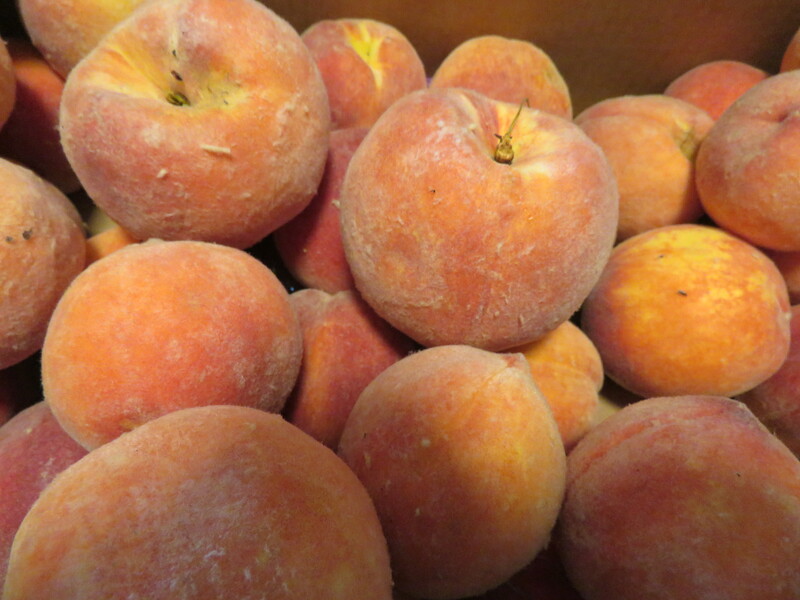 Coral Star peaches from the Shenandoah Valley. “O Lord, our Lord, how excellent is your name in all the earth. 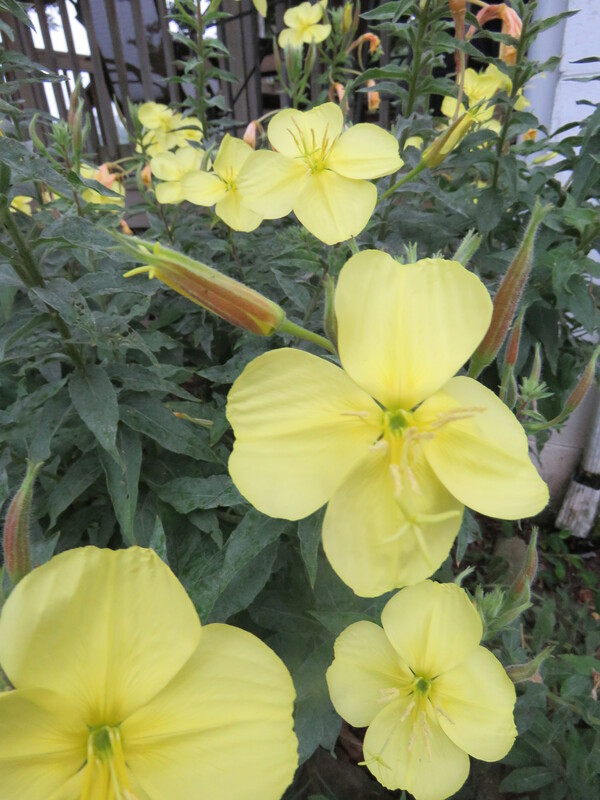 One of my favorite flowers is the Evening Primrose. 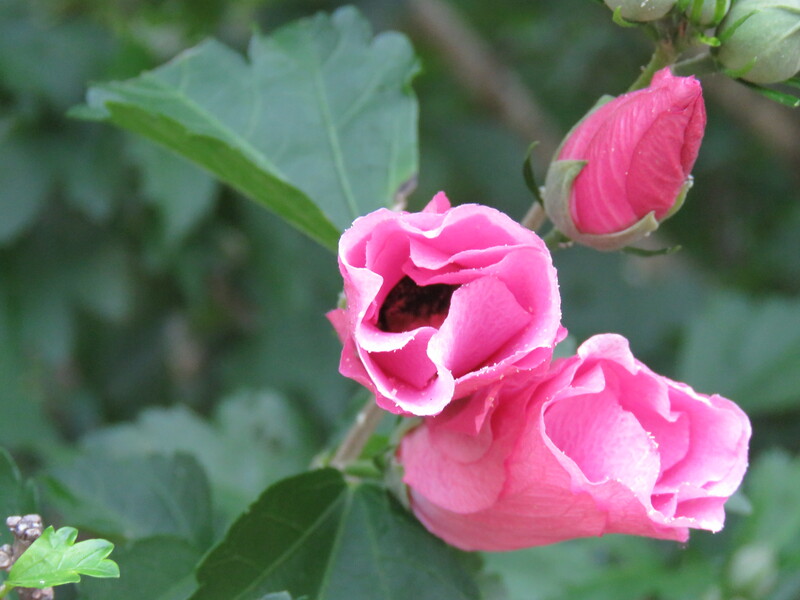 If you have never seen one open, you are missing a very special treat. They open in the evening just before dusk. Right now it is around 8:45 p.m. You can literally watch them pop open. The head of each stalk contains lots of little blossom pods. Before opening the pod swells up. 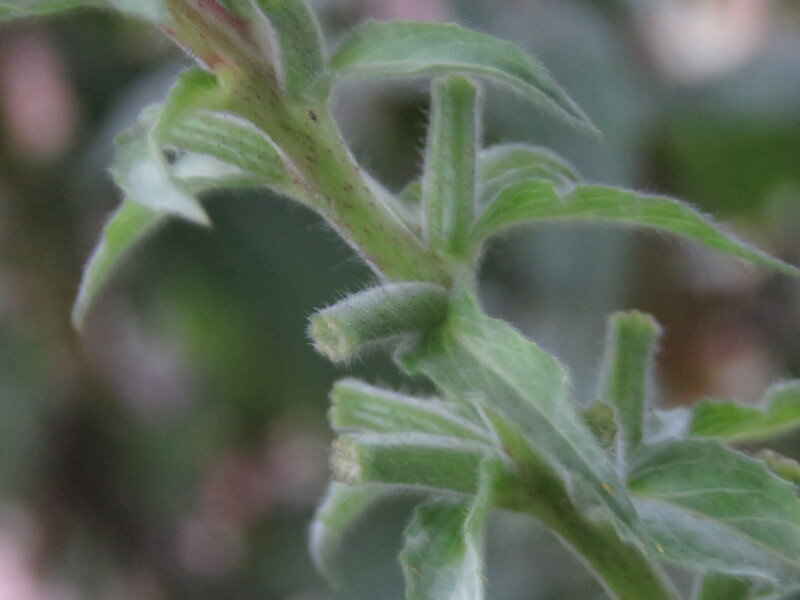 In the picture above you can see the already open flower and the one ready to pop open in about half a minute. The two larger pods behind with the reddish tint will open tomorrow evening and the next larger ones in two evenings. Just about as fast as you looked at these pictures, it happened. Years and years ago, a friend gave me a start and I have had them ever since. They are bi-annuals meaning they bloom the second year. 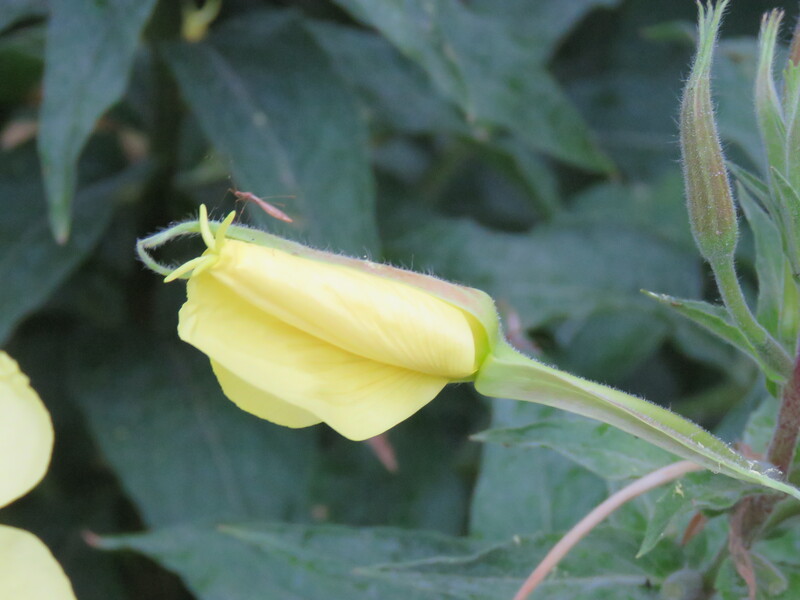 After they finish blooming the little pods you see sticking on the side of the stalk in the picture below will fill with very tiny black seeds. This fall they will shatter to the ground. 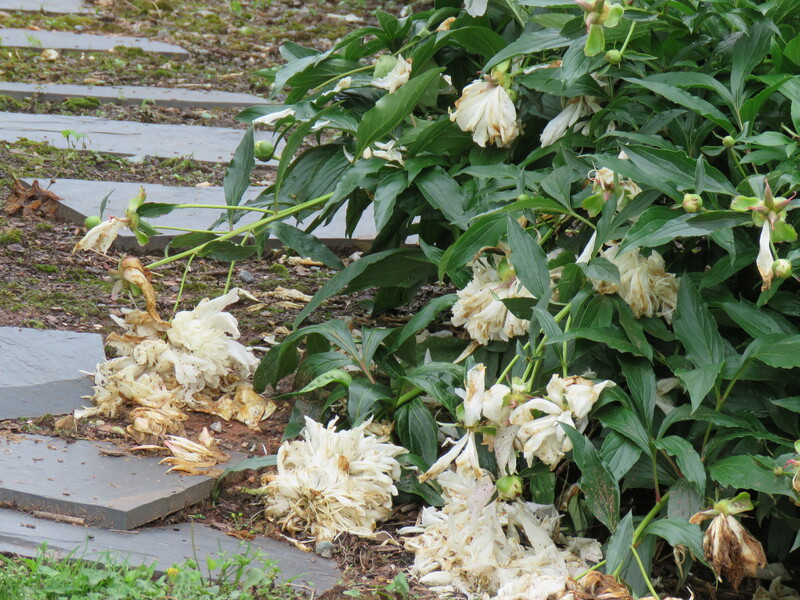 The plants that come up this fall or very early next spring will bloom next summer. The ones that sprout later-maybe April or May will stay little all summer and bloom next year. (See picture below). These are tucked in the flower bed under the blooming plants. 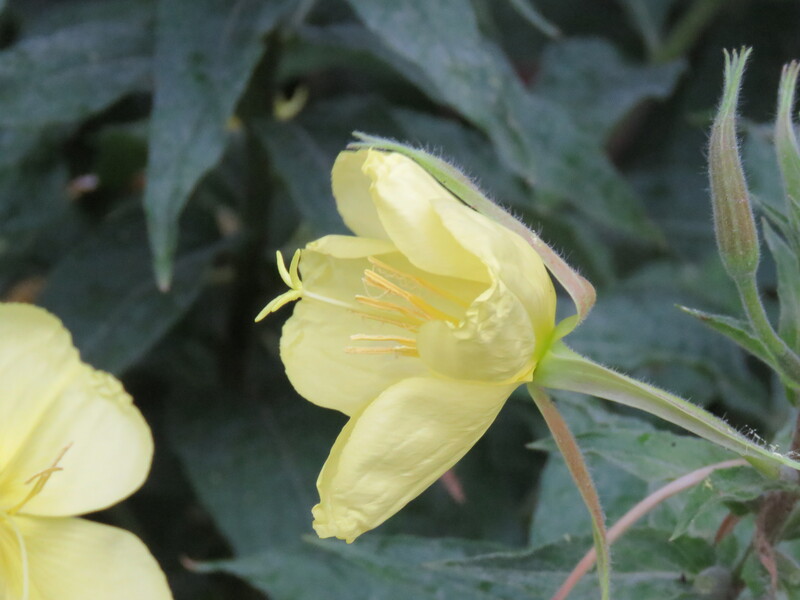 The flowers are very fragrant and at the peak of blooming the plants are loaded with bright yellow blossoms. 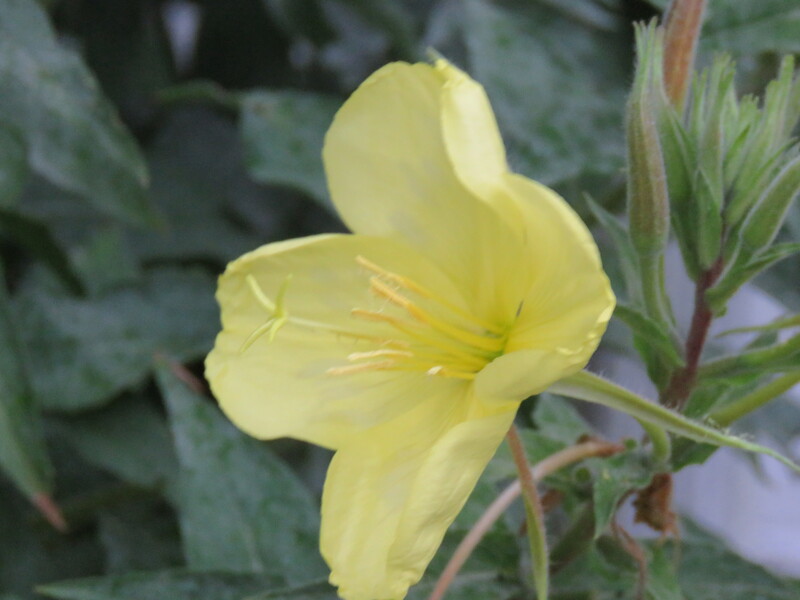 But this is one plant you have to sit outside in the evening to enjoy. By the time the sun is up in the morning they are on the decline. One thing you have to remember is, you don’t just watch one blossom open. Everyone of those flowers opened tonight plus more that aren’t on the picture. 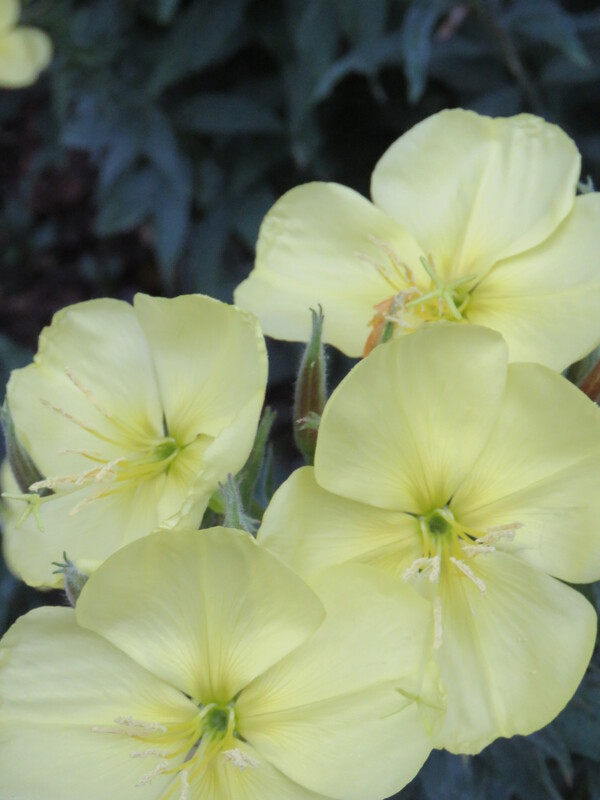 The hummingbird moths love this plant. 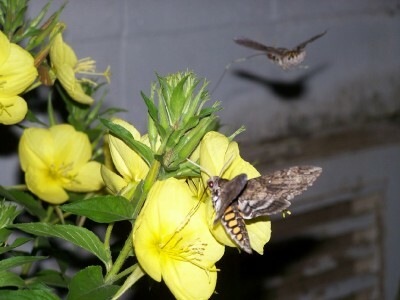 They look like a cross between a hummingbird and moth with the body of a moth and beak and hovering of a hummingbird. 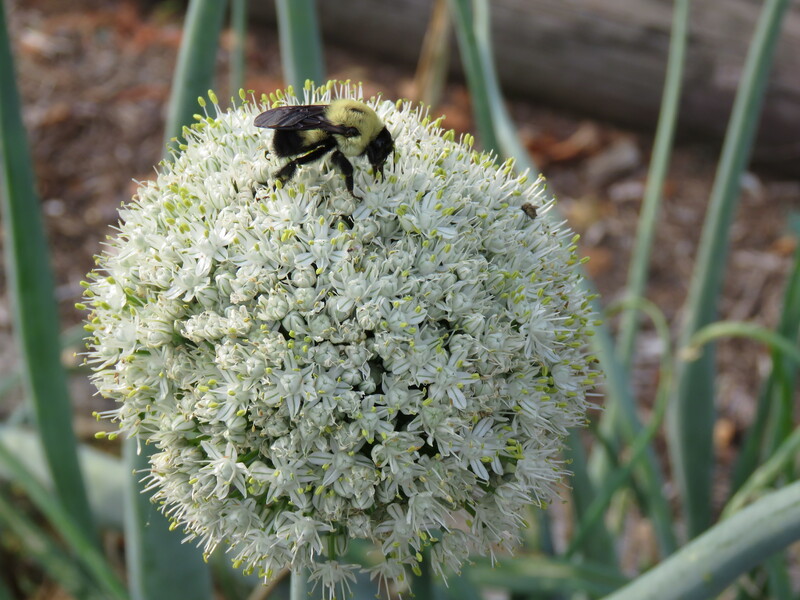 Under cover of dark, shortly after blooming, they buzz in and fill their beaks with the luscious, sweet nectar. I have two kinds of hummingbird moths; one with a short beak that buries his head into the blossom and the other with long, dangling beak that hovers above the flower and drops his beak into the blossom. The picture below is the long beaked moth. I don’t have a picture of the short-beaked one. 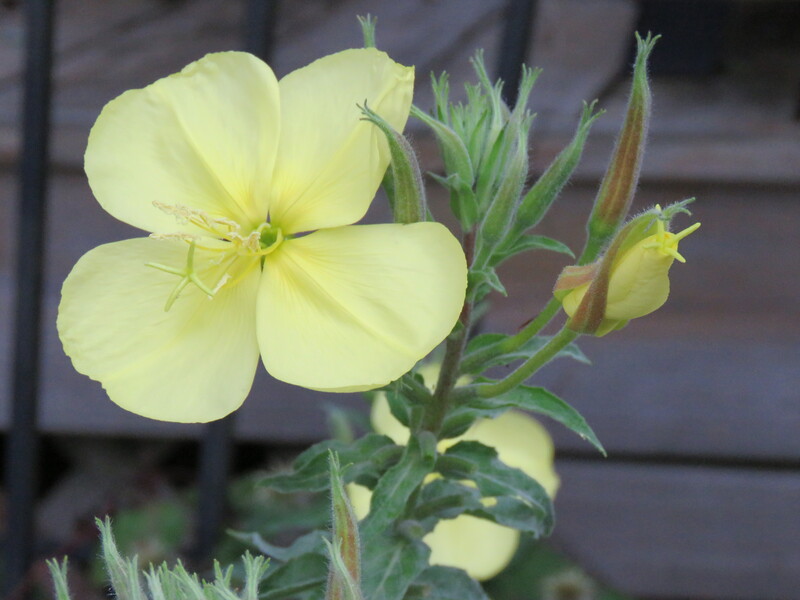 The Evening Primrose also comes in pink (which I don’t have) and it is a low spreading plant where the yellow one grows 3 feet tall. They are also considered a wildflower and if you are looking for them, you can find them in the ditch banks along roadways in unmowed areas. 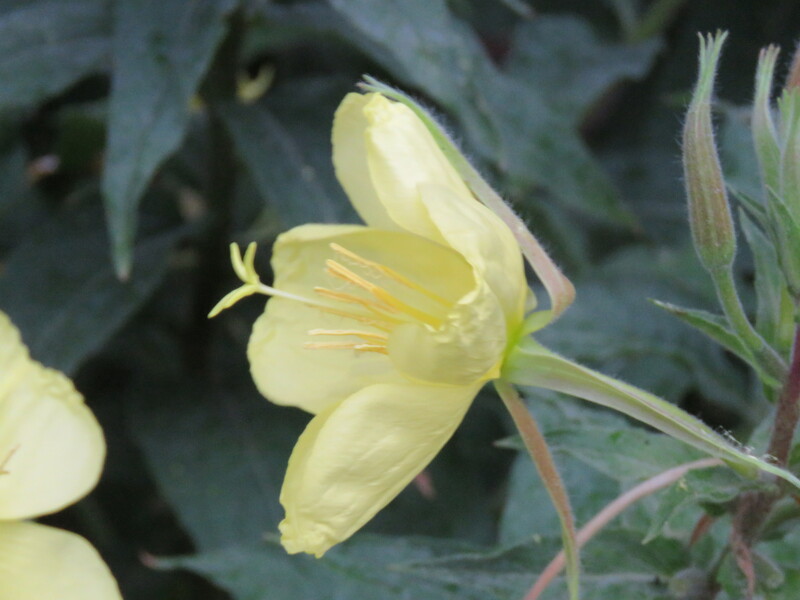 Most people never notice them because they are night-time blooming. 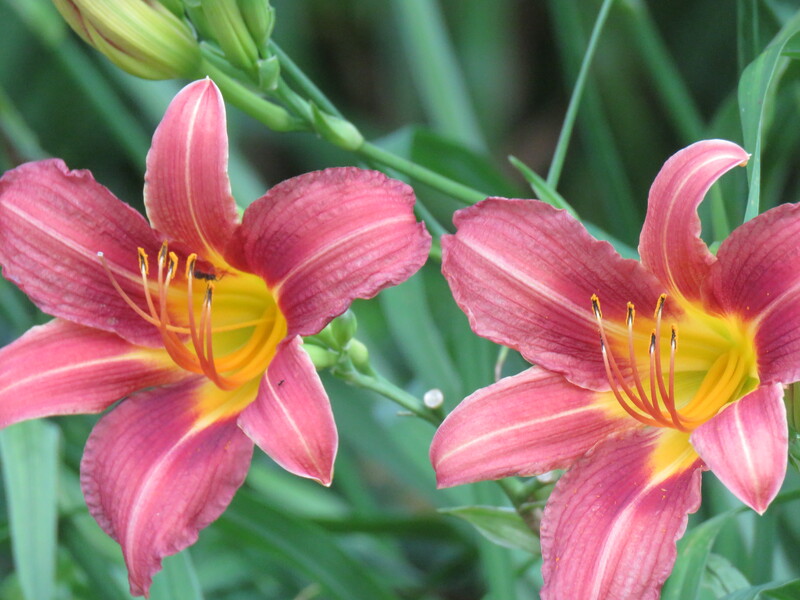 This 1-minute video shows a flower opening in real time. There was no editing, no shortening of time. If you want to see this spectacular God-show, I would love to have you stop by (call first to be sure I’m home). 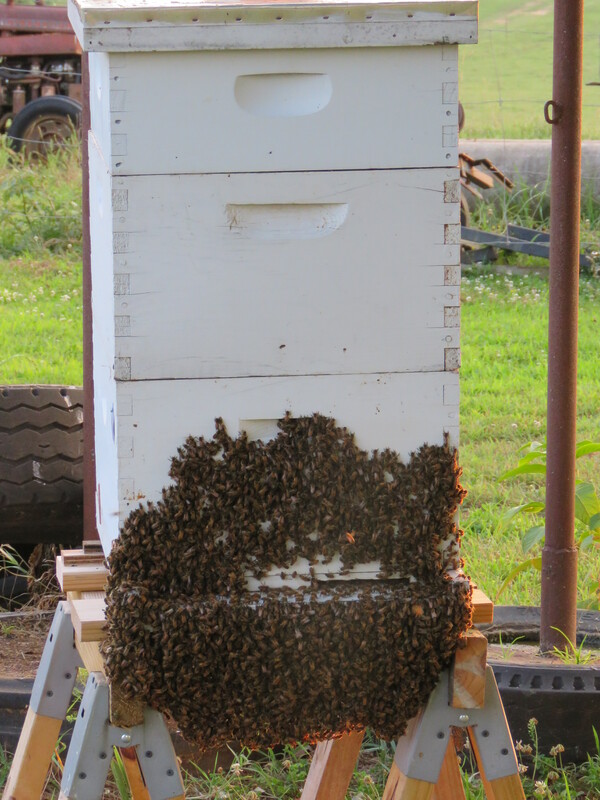 Right now they are at their peak and by mid-July it will be almost over. It will be an evening you will always remember. Grandkids, Karla and Ryan, are here with us for several days while their folks are celebrating their anniversary in Cancun. My instructions from her mom was to teach Karla to drive. She can get her learners in March but has zero driving experience nor a good place to learn. The biggest and fastest vehicle she has driven has been my golf cart. K: Grandma, I’m terrified. I don’t think I can do this. G: Yes, you can. It’s not hard. I told her how to start the truck, what the letters (P, R, N, D, L) meant and what the brake and accelerator were. Immediately the right foot went on the “go” pedal (according to her) and the left on the brake. I smiled to myself but didn’t say anything. 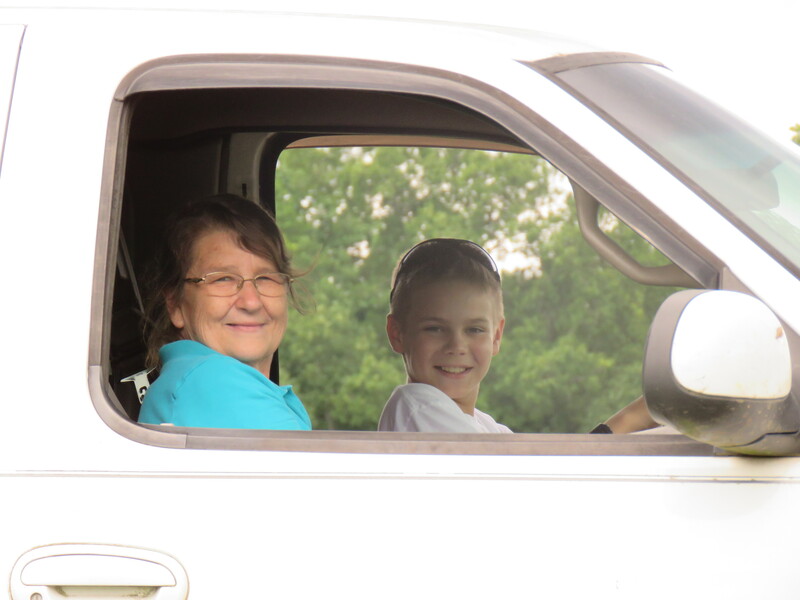 Sitting on the front of her seat, she grasped the steering wheel for dear life and started the truck. It immediately started moving forward very slowly. K; Grandma. It’s moving. How do I stop? I’m terrified! I think she used the terrified word at least two dozen times! G: You are doing just fine. But you can push the brake to stop. Her left foot instantly pushed the brake to the floor. We were probably going one mph but we also immediately lurked to a stop! By now we are both laughing so hard she can hardly drive. The next lesson is on using only the right foot for both petals and pushing the pedal evenly. G: “Your foot can move from one pedal to another”. The concept of only using one foot seemed totally unrealistic to her. After all, you have two feet and two pedals! I explained the safety issue involved with using two feet. 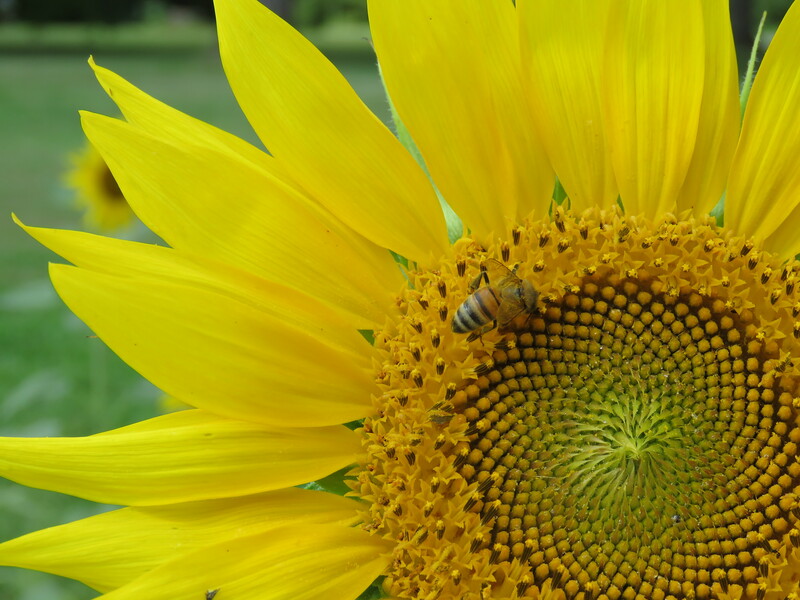 You don’t want to push both petals at the same time! Karla did a great job. She made it to the end of the field and back several times at the neck-breaking speed of 4 mph. I assured her she was not going fast and that on interstate you go 70 mph and that eventually she would have confidence and experience. Suddenly going 70 mph and entering traffic on interstate seemed like an paralysising feat and she just did not know how her dad did it. 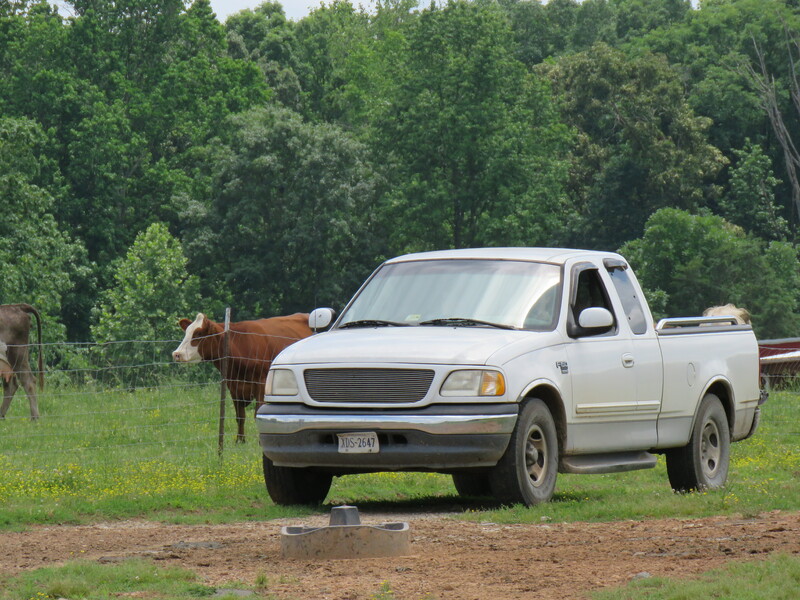 When we were done, I had her drive over the sixteen foot wide cattle guard back to the yard and park beside our car. She was sure she was going to hit the side post of the gateway but she did it perfectly. This was a hilariously funny event. I laughed and laughed at her crazy thoughts and expressions. 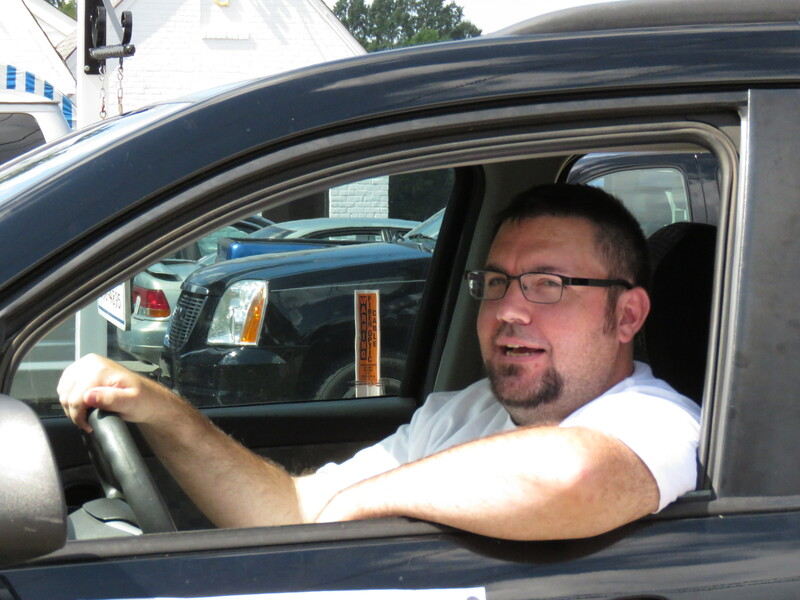 Lesson 2: We had a lesson on reverse, signaling, the horn and windshield wipers. 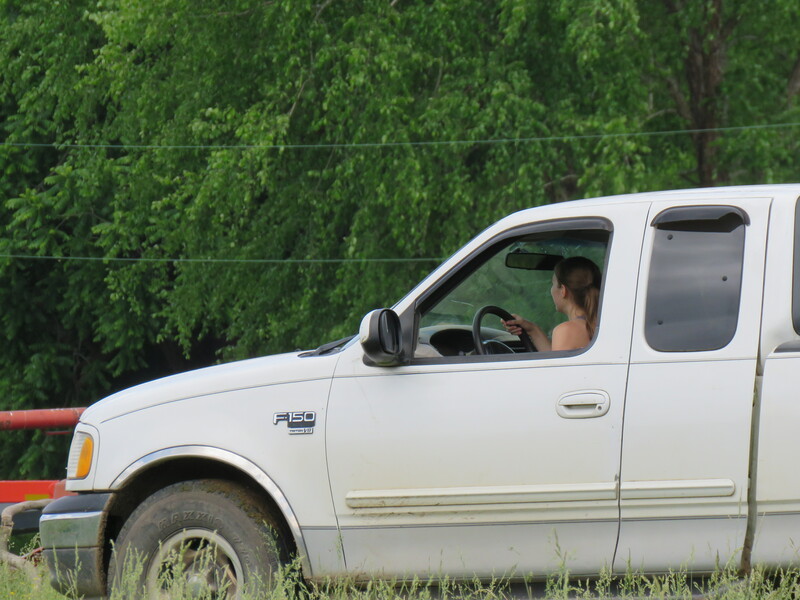 This time I let her drive to the field which meant she had to back out of the parking space beside our car. We talked about how to see behind using the mirrors or turning your head and looking. She just knew there was going to be something in the wide open space behind her that she couldn’t see and was going to hit! 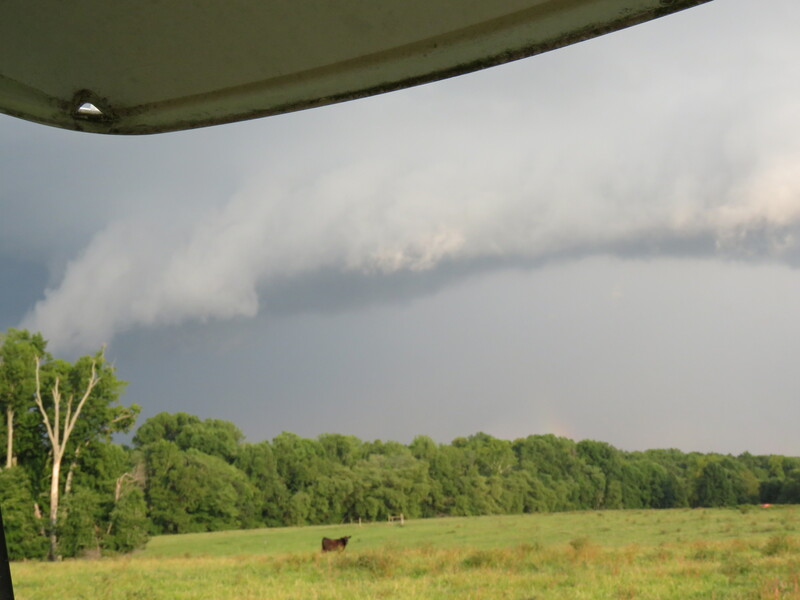 We made it to the pasture and this time went further; through a second gate opening into the back pasture. 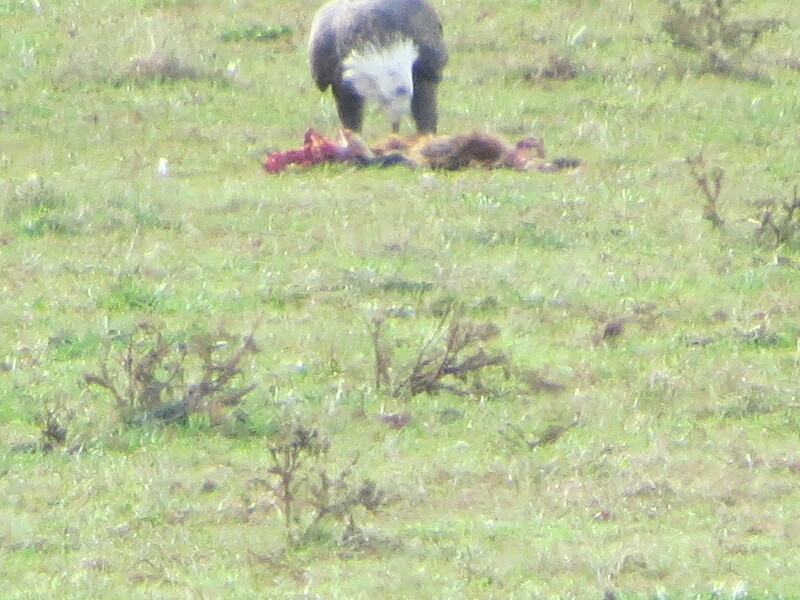 We saw two wild turkeys and a coyote which was an extra little bonus. She loved the turn signal. When we came to the end of the road and she had to turn around in the pasture, she stopped and put on her signal. We did squares in the pasture and at each turn, she signaled. But she had to stop in order to signal. I explained that when she is driving on the road, she will use the signal to let other drivers know she is planning to make a turn. This also means you have to turn it on while you are driving and before you get to where you are going to turn. The cows were out grazing in the field and several crossed the driveway we were on. She pretended it was a pedestrian crossing. Again, she was sure she was going to hit one of them but I showed her how to keep easing forward very slow and they would move. On the last lap back to the house she reached the unfathomable speed of 10 mph. She beamed with pride! Lesson 3: This time there was a big improvement in her confidence. She adjusted the seat and leaned back. She maneuvered the truck out of the parking spot and into the field. This time we went exploring across the pastures. 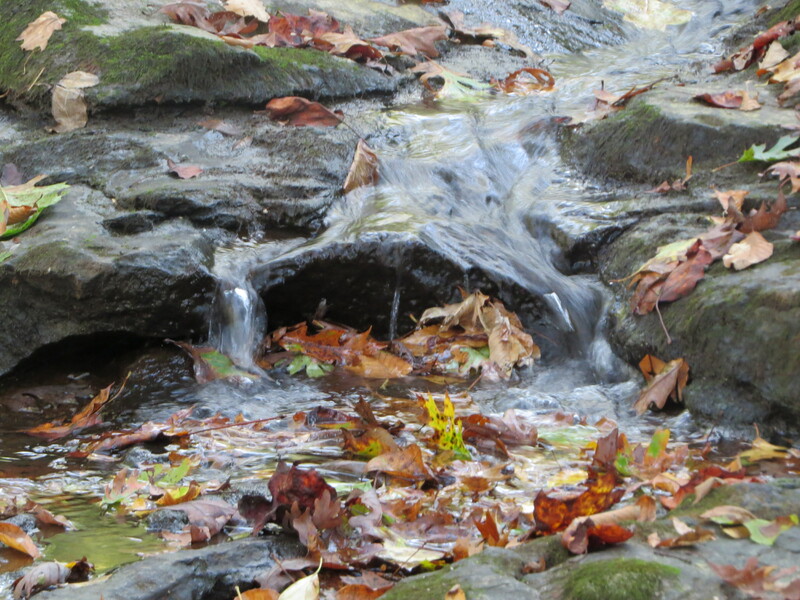 She had to ford a small creek with a somewhat narrow opening and was astounded that I thought she could do it. The cattle were also out moving around and at the same time they were wanting to cross the same creek. We had to sit and wait until the last cow had crossed so that she could go. One cow was being stubborn and was standing in the way, facing the truck and still eating the grass hanging out her mouth. Karla beeped the horn and the cow, with a defiant posture and stern look, immediately responded with several loud moos. We laughed and laughed. I just wish I had my camera! Grandpa had driven in the field that morning checking the cows and left tire tracks across the field. She had great fun following them as they wandered across several different pastures. Lesson 4: This time I handed her the keys to the car. Her eyes got as big as saucers. 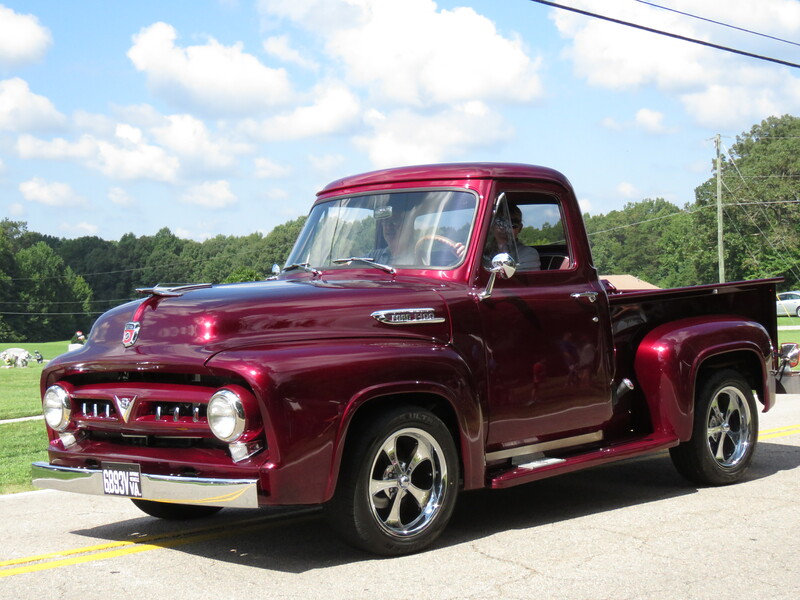 This was very different from the pickup. It sits lower, is smoother driving, the wipers are on a different lever and the lever to put the car in gear is on the console. She was sure she might hit something but took to the change with ease. She eased up to 20 mph for a few brief moments. 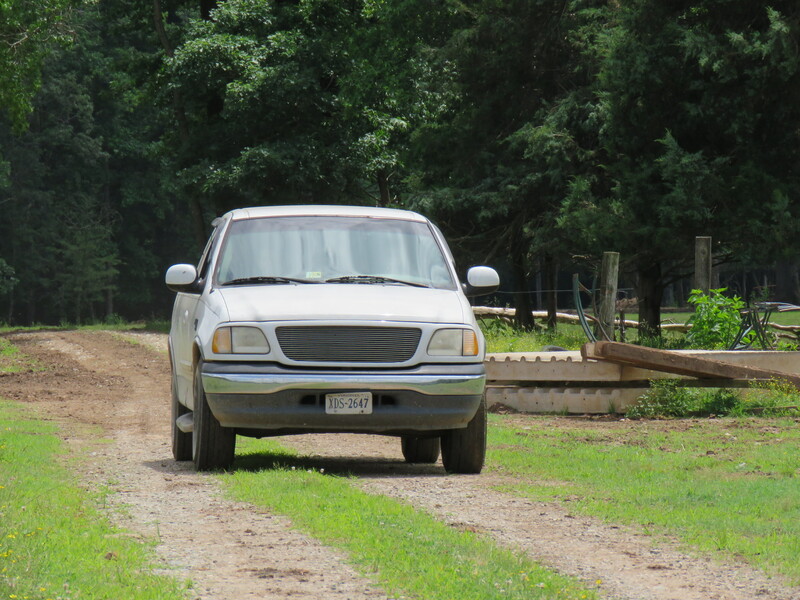 This time after driving the pasture driveway, we went out and back the driveway. I noticed she actually turned on the signal while driving. Karla is going to do just fine. We will have several more lessons tomorrow before she goes home. Each time we drove, I could see her gaining confidence and that she was very happy and pleased with herself. It was a priceless privilege to be the one to share this first time experience with her. I will always treasure the memory. I just wish I could have taped all her comments. Ryan, who is two years younger was just yearning for the privilege of driving. 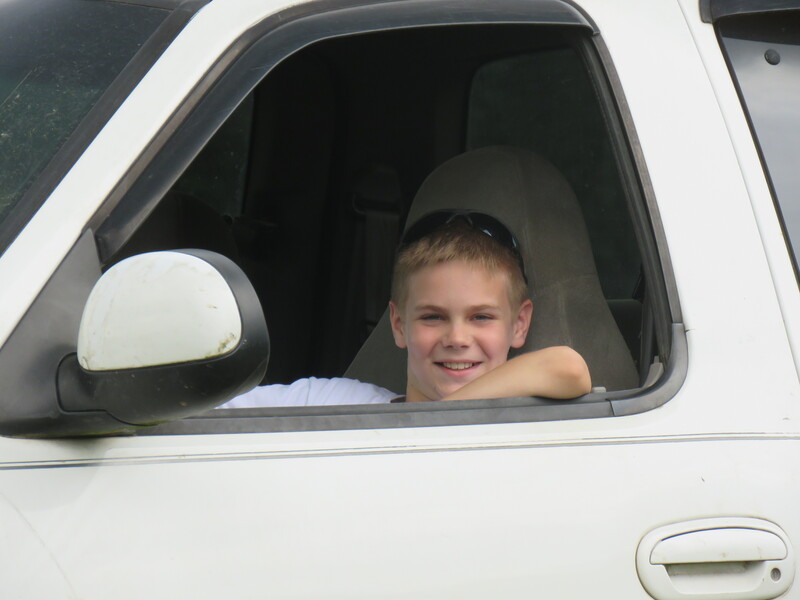 I told him yesterday that if he helped to complete the mulching job we were working on, I would let him drive. I had a very hard-working, willing worker! Where Karla was cautious and unsure of herself, Ryan was bubbling with eagerness and anticipation. 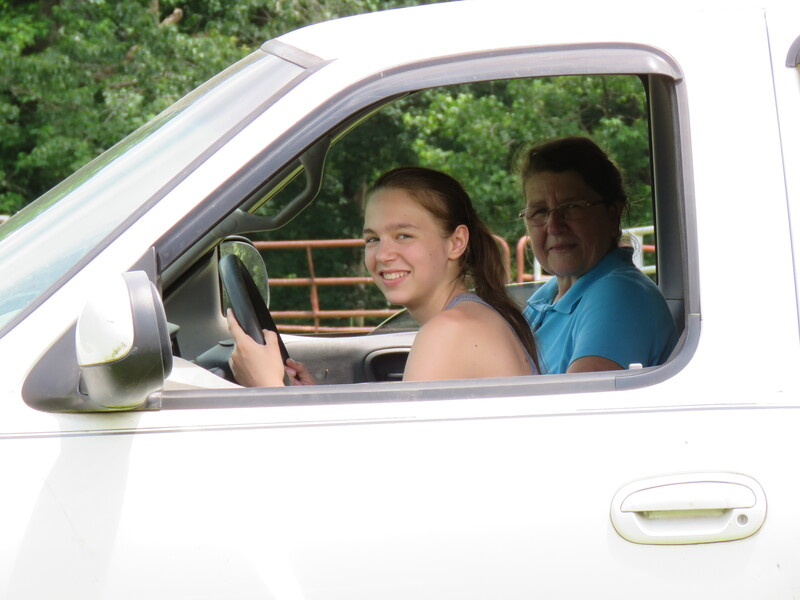 Farm kids have a huge advantage over others in learning to drive. They are privileged to the open land and learn at a young age to drive a lawn mover, four-wheeler, motorcycle, trucks and other farm equipment. By the time they reach driving age, they have accumulated a vast variety of experiences, including; backing trailers, maneuvering narrow spaces and different weather and terrain conditions. I remember learning to drive. Daddy had an old stick-shift dodge truck that shifted hard that he let me roam the pastures in. It was almost impossible to put into gear without grinding at least a little. The truck was parked in a narrow lean-to on the side of the bank barn that was on a downhill slope. 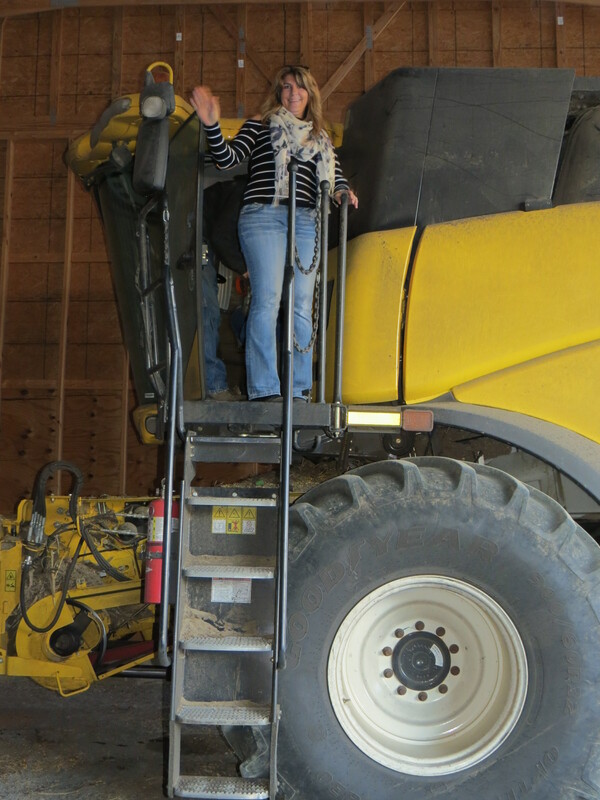 I had to learn to back the truck into the shed which had about 12 inches (or less!) to spare on each side of the rear view mirrors and pull out of the shed without coasting backwards. Only those who have driven a stick shift can appreciate how truly difficult that was. I am still amazed I learned to do it without ever hitting the barn or coasting backwards. 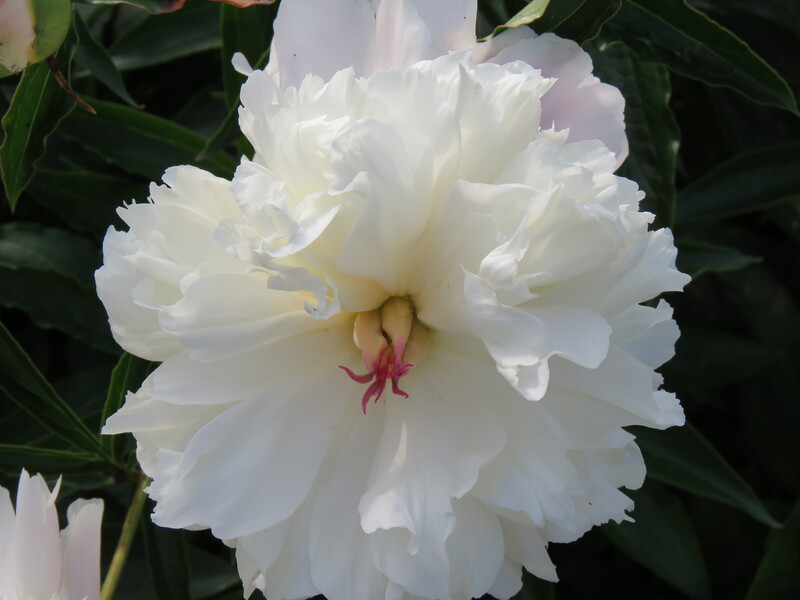 I have numerous favorite flowers but I have to say the exquisite, perennial peony has to be top, even though roses and daisies follow close behind. I can remember my mother having a long row of the fragrant bushes on the farm where I grew up. 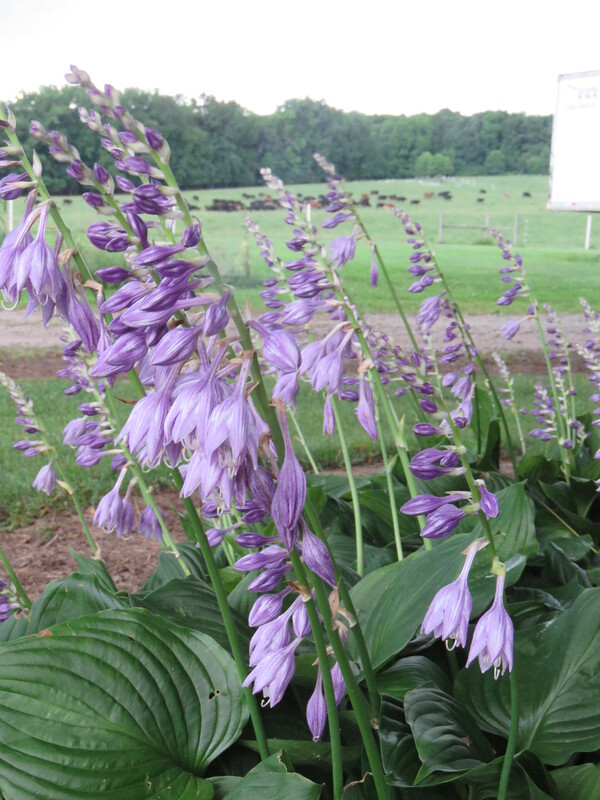 When I got married and moved to Powhatan, I discovered that Gene’s dad had planted a stunning row of them beside the house several years prior. 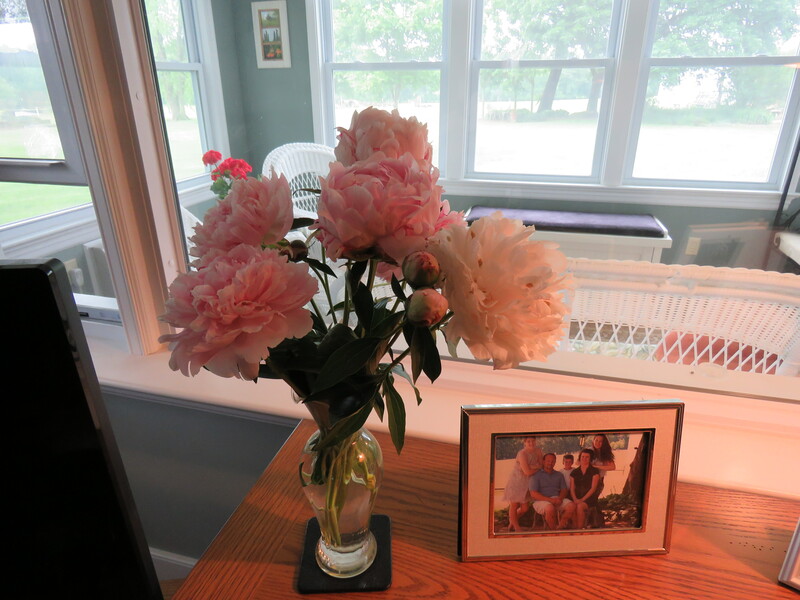 I can always count on them starting to bloom the week before Mother’s Day. They don’t last more than 2-3 weeks but the fragrance is like no other flower. 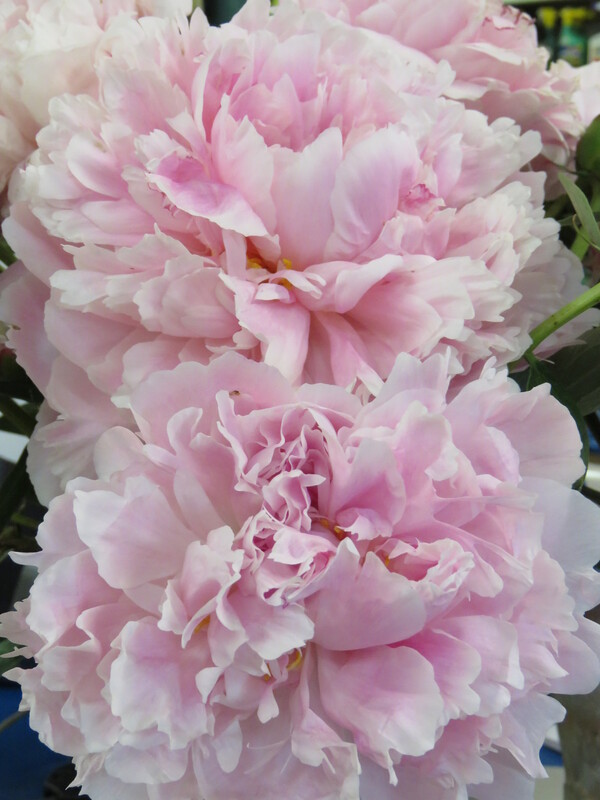 It just begs for you to bury your nose in the soft, velvety petals and breathe deeply. They do really well as cut flowers and make a stunning, fragrant bouquet that catches your attention when you step into the room. 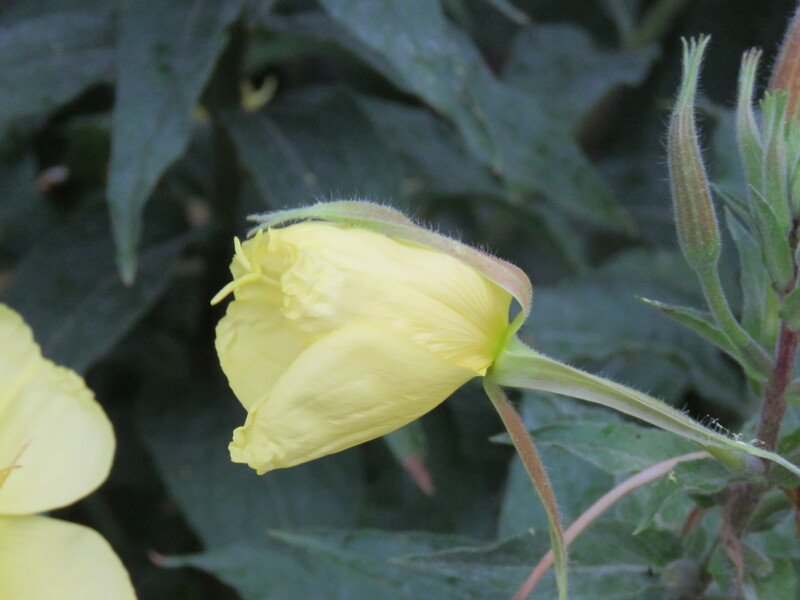 It is best (they last longer) to pick the flowers while they are still buds. This will also decrease the amount of ants you carry into the house! 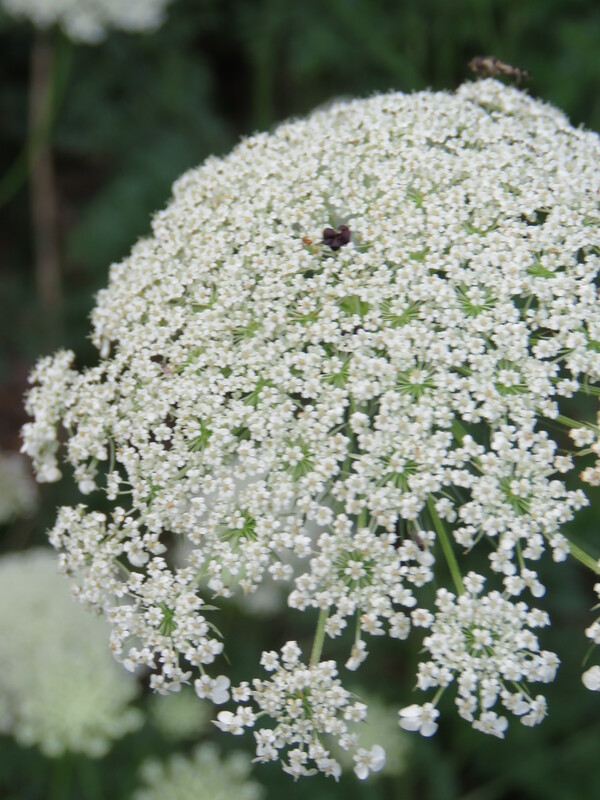 Ants are attracted to the sticky sweetness and also help to open the buds. The first, “on my own,” gardening year, I sprayed them with pesticide to kill the pesky rascals. That was a mistake! I learned the importance and value of ants. 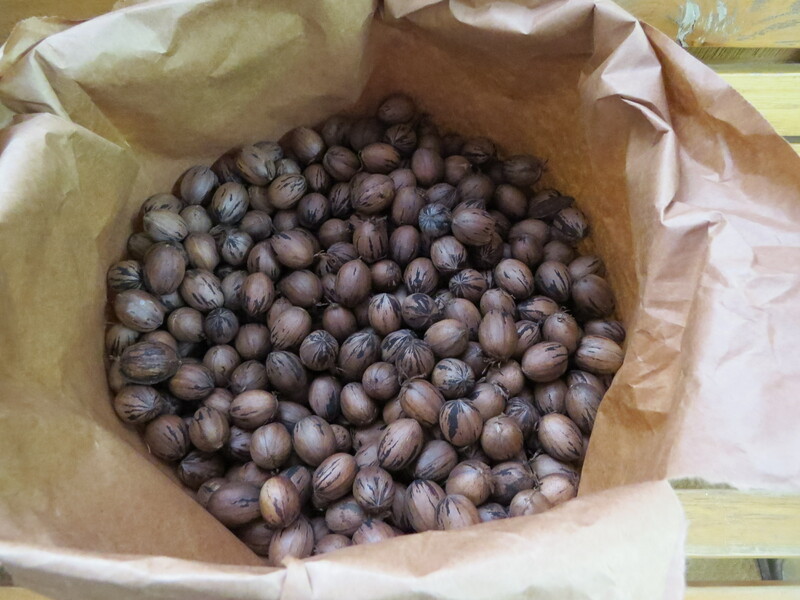 To determine when the bud is ready to pick, take hold of the bud between your thumb and first finger and gently pinch. If it is squishy, not hard, it is ready. 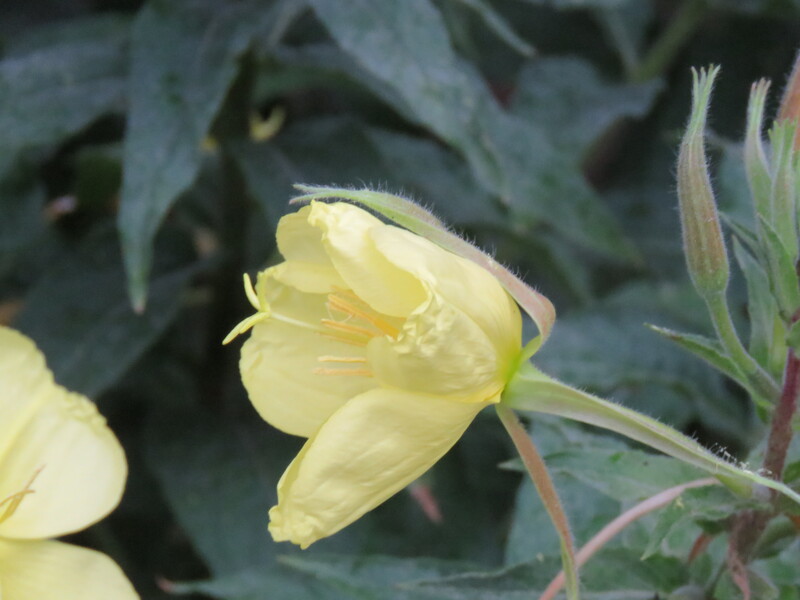 Within a day of being cut, they will open to a full flower. (I just recently learned this trick from a gardening friend, Lisa Ziegler). 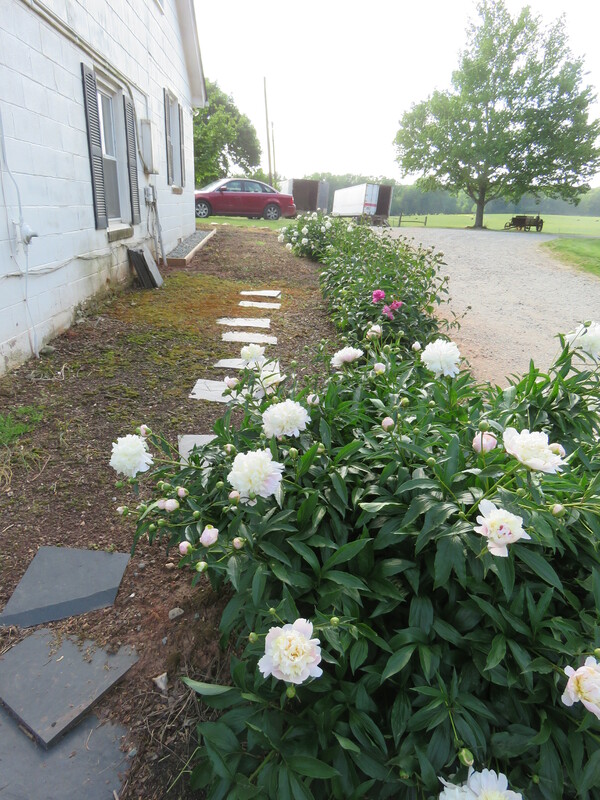 My row of peonies is at least 48 years old, maybe older. I have never divided them, although it probably would be a good idea. I am afraid I might mess up a good thing. 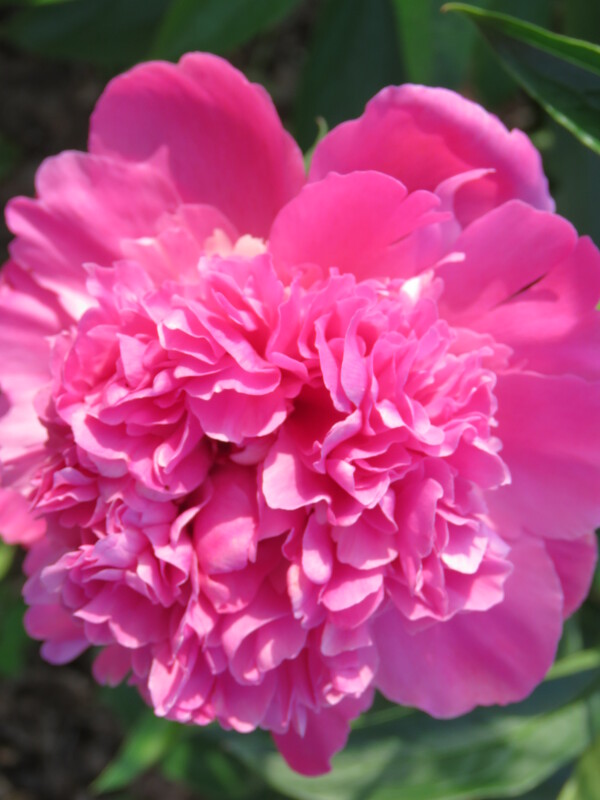 They say peonies need very little care and can produce for 100 years. 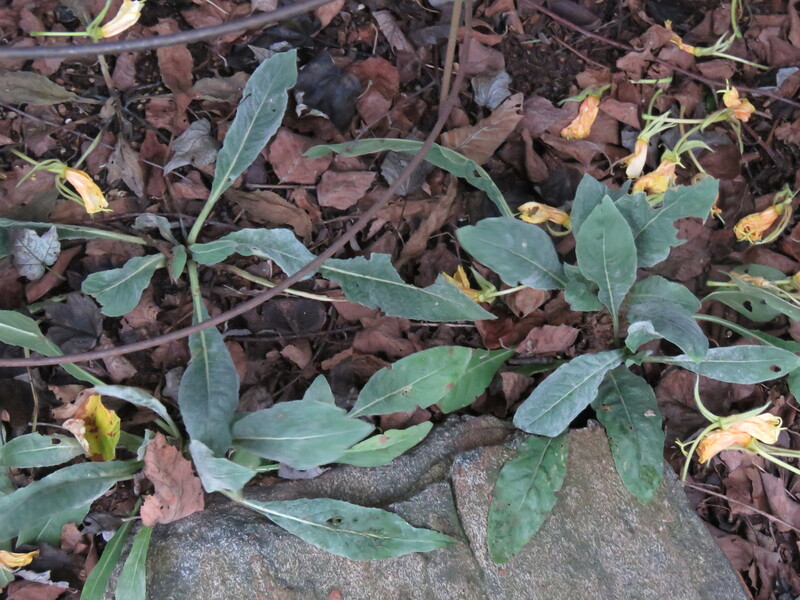 In October after the stalks have died, I cut the dead foliage off as close to the ground as possible. 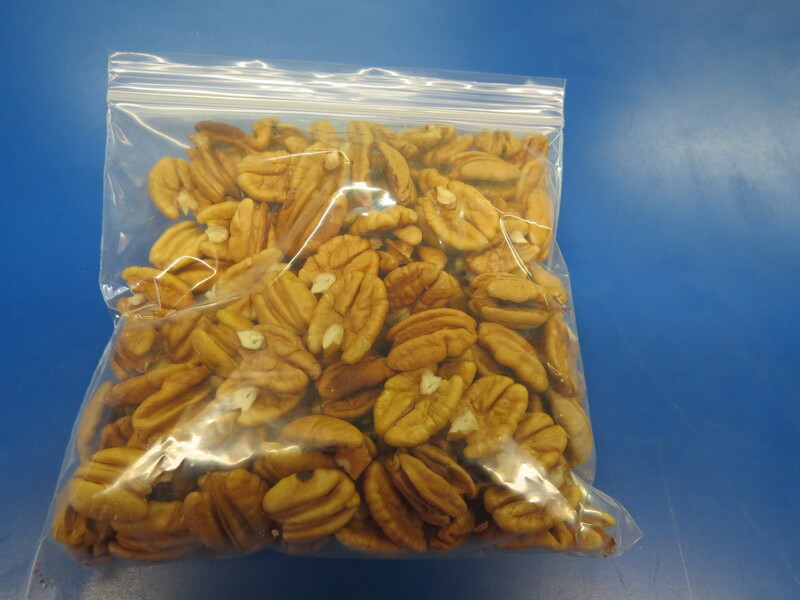 That is all I do to prepare them for winter and the following spring. If you are want to transplant or divide the plants, October is the month. The first year after replanting they probably will not bloom. You need to be very careful in replanting that you only cover the roots with 2-3 inches of dirt or they will not bloom. 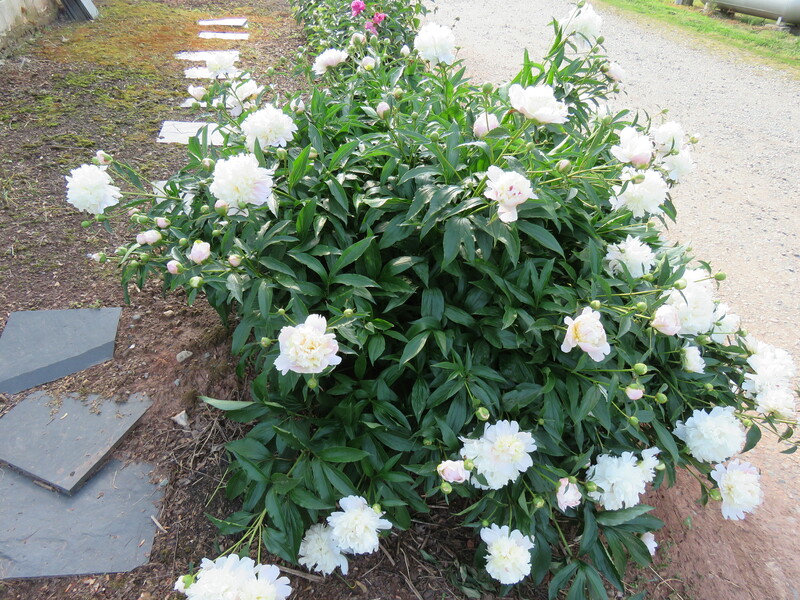 Peonies love sun but also like some shade protection during the hottest part of the day. 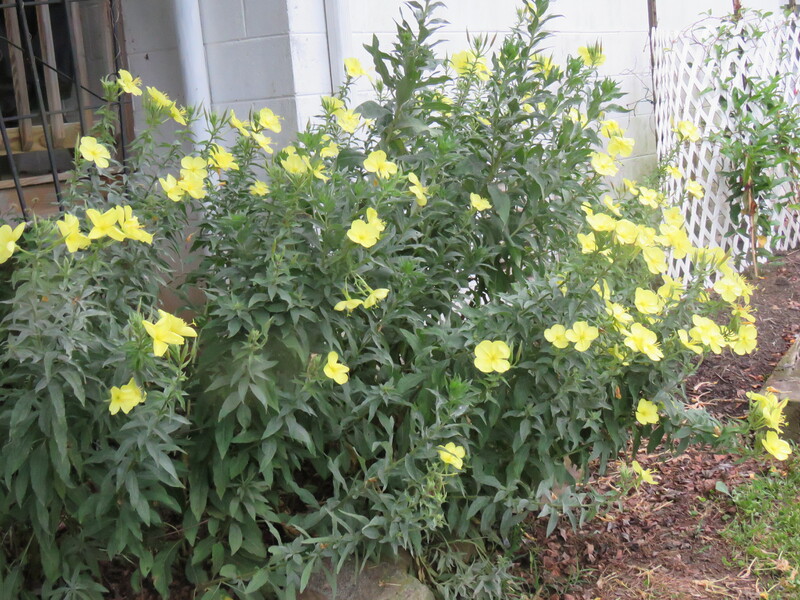 Mine are planted on the north side of the house but because they are about 6 feet away from the house they have the benefit of a lot of sun and a little shade. It has been a perfect spot. 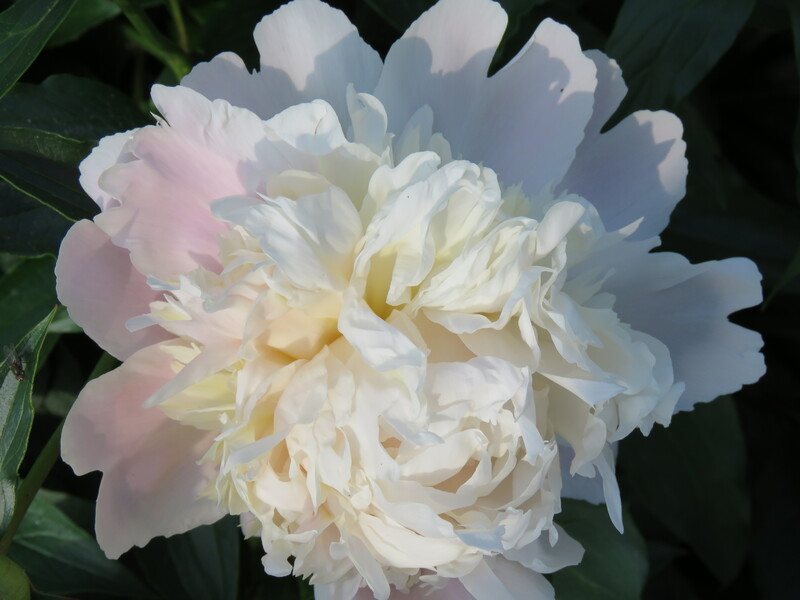 Peonies come in different colors and varieties, the most popular and hardy, being the old-fashion white. I also have a lovely, soft, light pink and a medium pink. The red I have replanted several times, I just can’t seem to keep it. 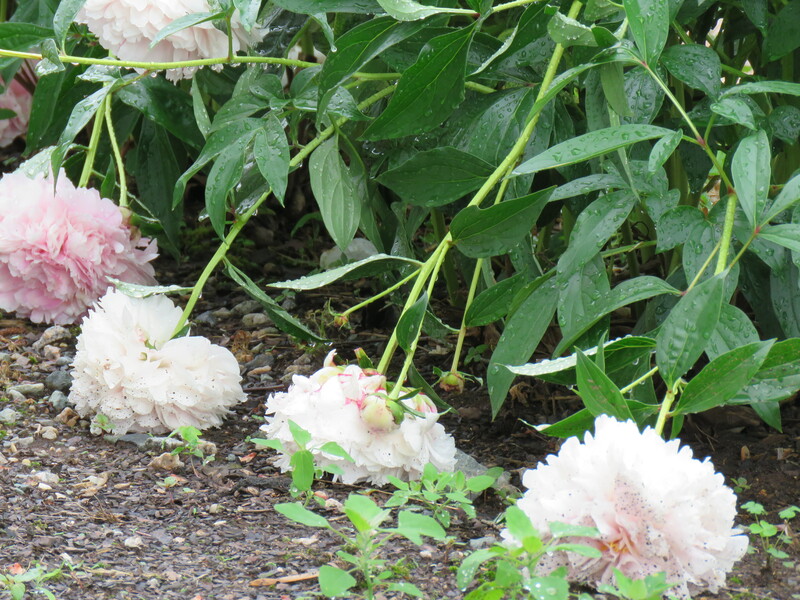 Rain is not kind to peonies once they start to bloom. 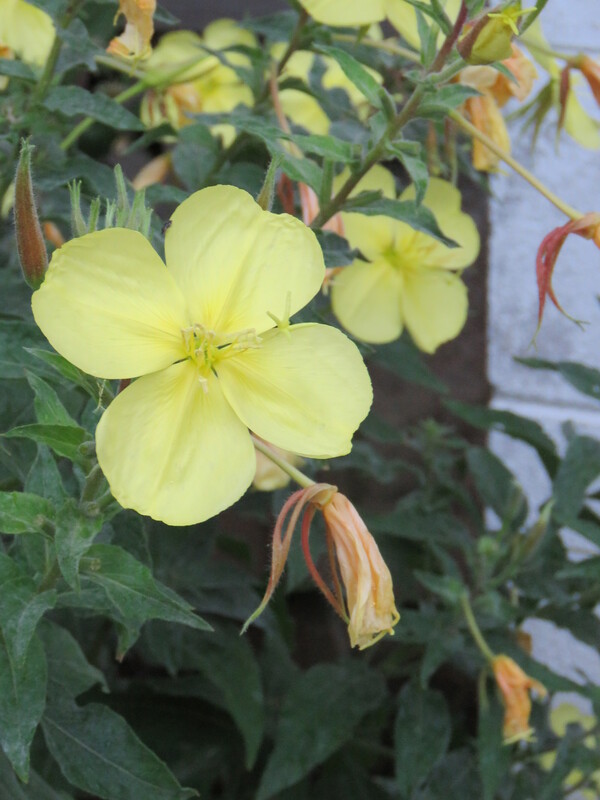 Because of the very large flowers and multiple blossoms per stalk, the rain weights them down and the blossoms quickly turn brown. This year was especially hard on them. We have had 5 inches of rain in the last week just as they are at their peak. Even the buds hang their heads. I like using peony rings with my plants. You can’t see them and it helps to hold the heavy stalks and keep them from falling over. 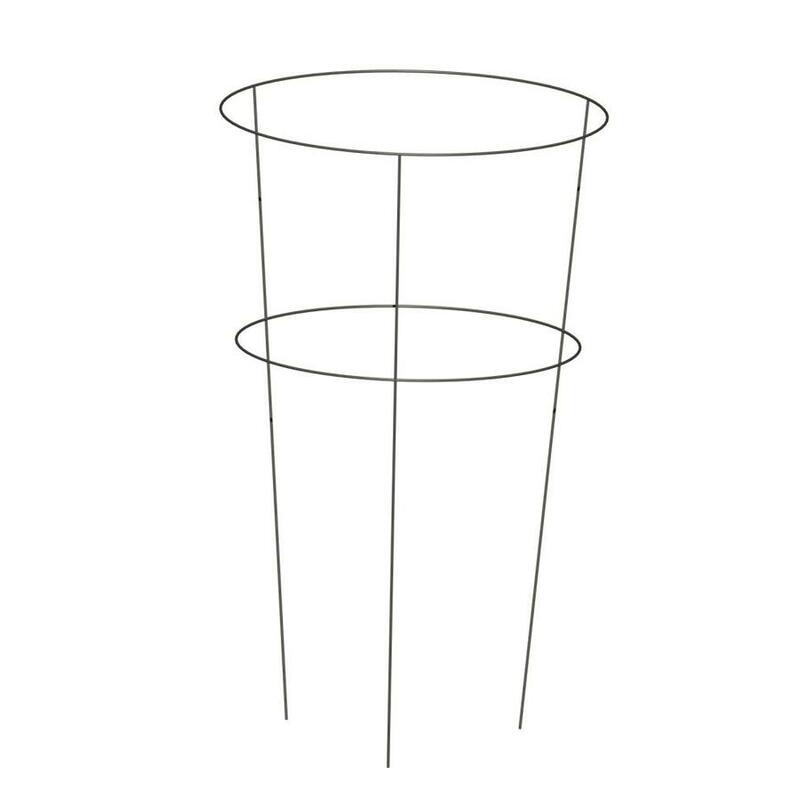 I prefer the open two-ring style that looks like a tomato cage, only shorter, rather that the one with the grid top. A good website with more information is Almanac.com. This shows my ignorance but I really thought the moon would have a blue tint to it, after all it is called a “blue moon”. 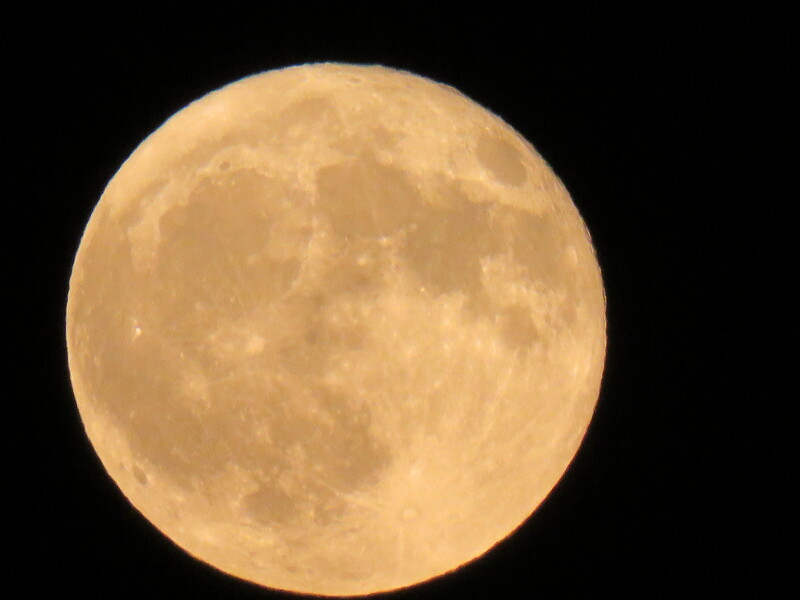 The full moon was huge tonight and beautiful and I got several really nice pictures. I didn’t have any city skyline or magnificent building for a back drop, just a quiet country sky with a million stars shining. When the moon wasn’t blue, not even a hint of blue, I went to my friend “google” and did some research. 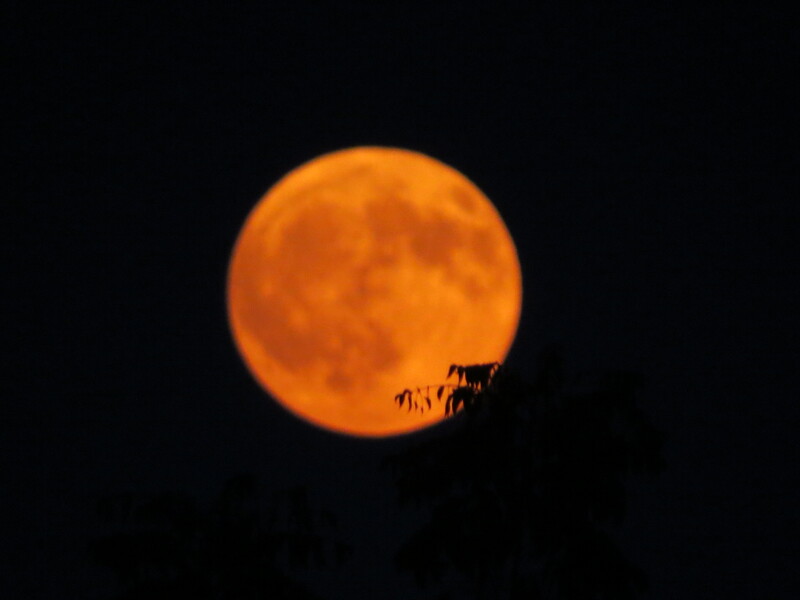 When there are two full moons in one month, the second full moon is called a “blue moon”. Now, that is not even creative in my mind but what am I to know! This doesn’t happen often. Ironically there were two full moons in January (January 2 and 31) of this year, none in February and two in March (March 2 and 31). This will not happen again until October 2020. The added excitement for tonight’s full moon is that it is just hours from dawn on Easter Sunday. 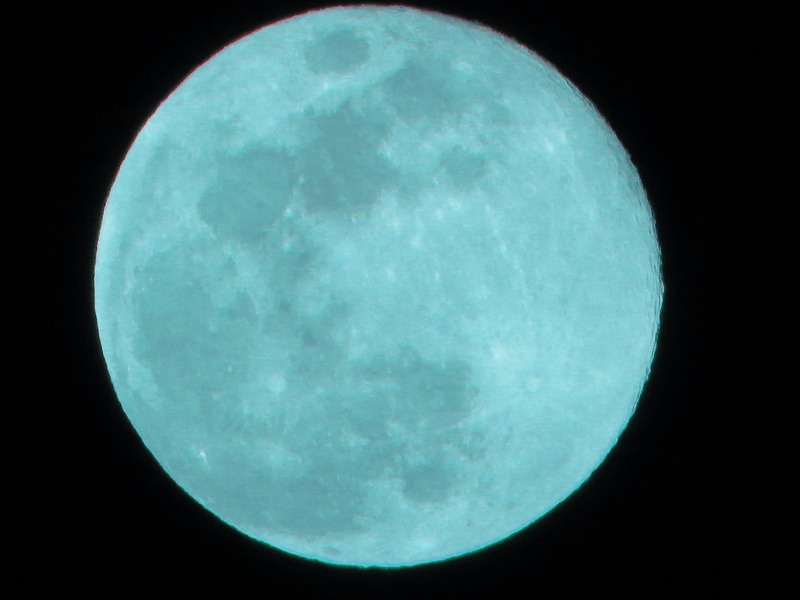 There is a more detailed explanation at the following website 201 2nd Blue Moon on March 31. There is a phenomena when there can actually be a bluish colored moon when there is volcanic dust or smoke in the atmosphere. The other phenomena is when you photo-shop the picture. This is my blue moon!!! 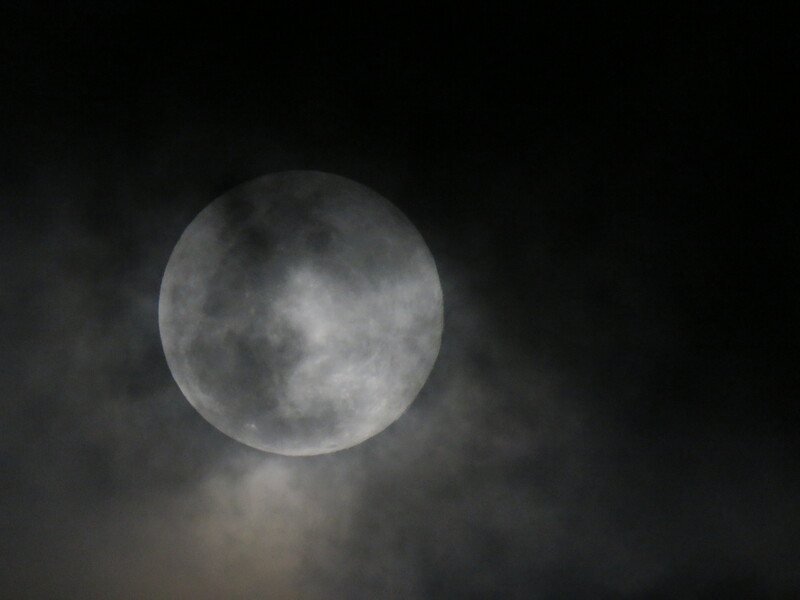 I also love the picture I took of the moon last night as it slid in and out of clouds. 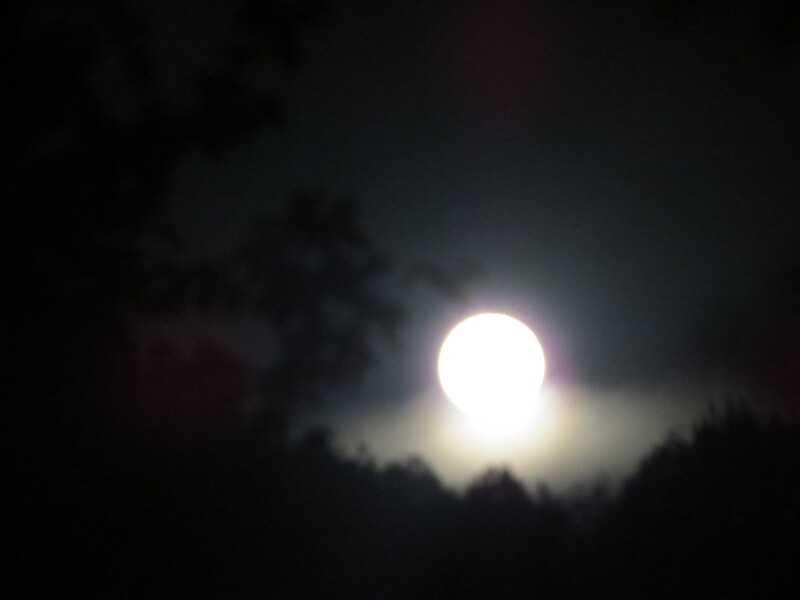 I had gotten confused and thought it was blue moon night. We have guests/friends who are dairy farmers (Valter and Lida Medeiros) visiting this week from Bermuda and they wanted to see a dairy farm while they are here. 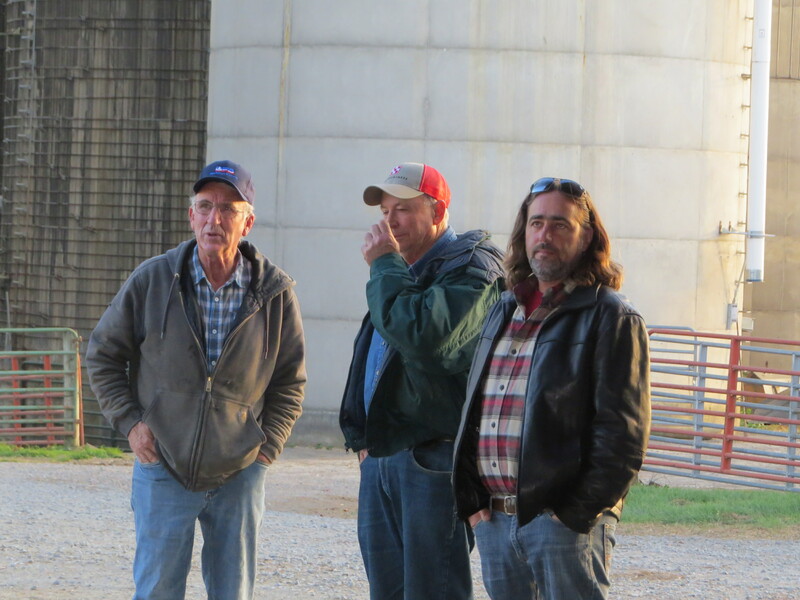 We chose Cub Run Dairy owned by Gerald and Anita Heatwole of McGaheysville, VA for our field trip on Saturday. 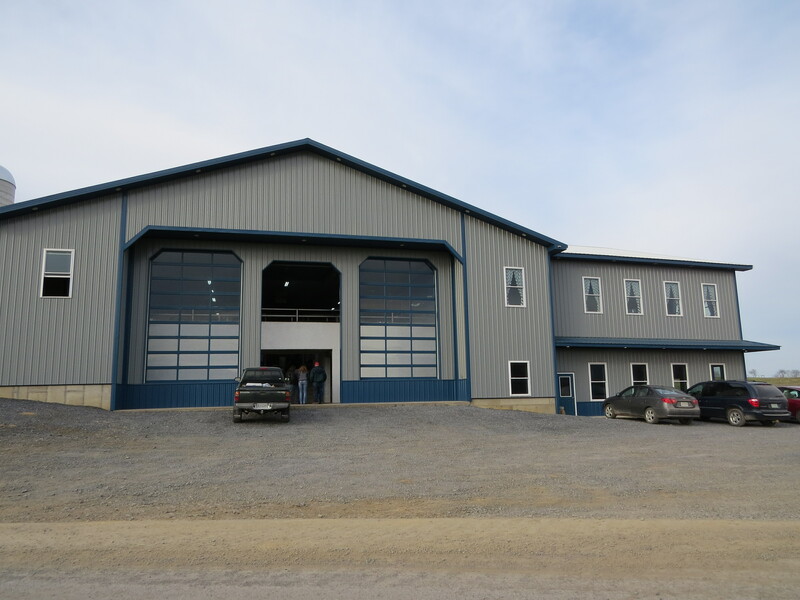 The new dairy facility is complete with observation decks and conference rooms welcoming people and tour groups to visit. 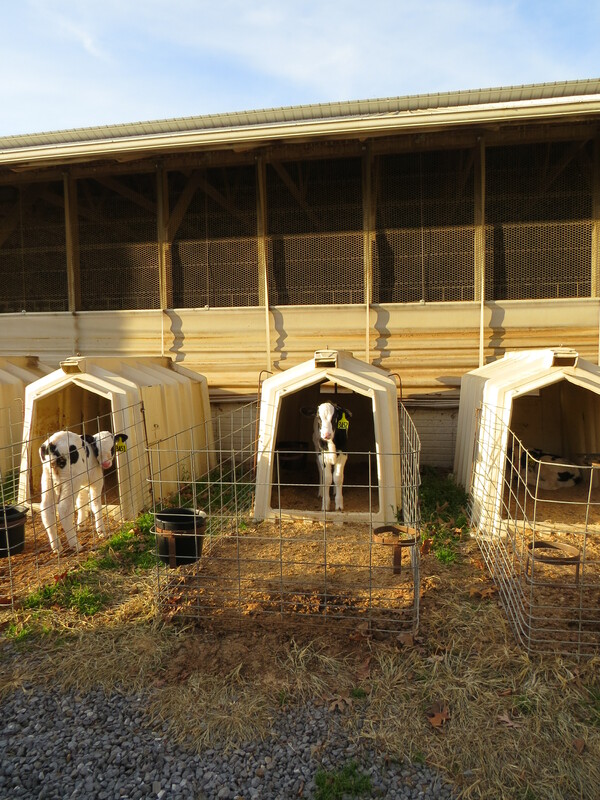 The Heatwoles along with their son, Monte, milk over 600 cows and in the past several years have done extensive upgrades to their operation. It was a fascinating and amazing experience. 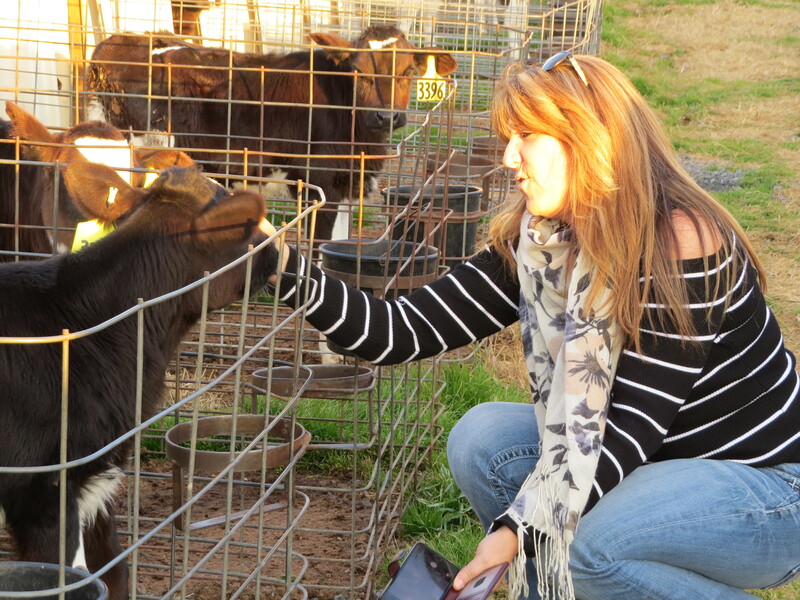 I am a farm girl; raised on a dairy farm and married a dairy farmer. 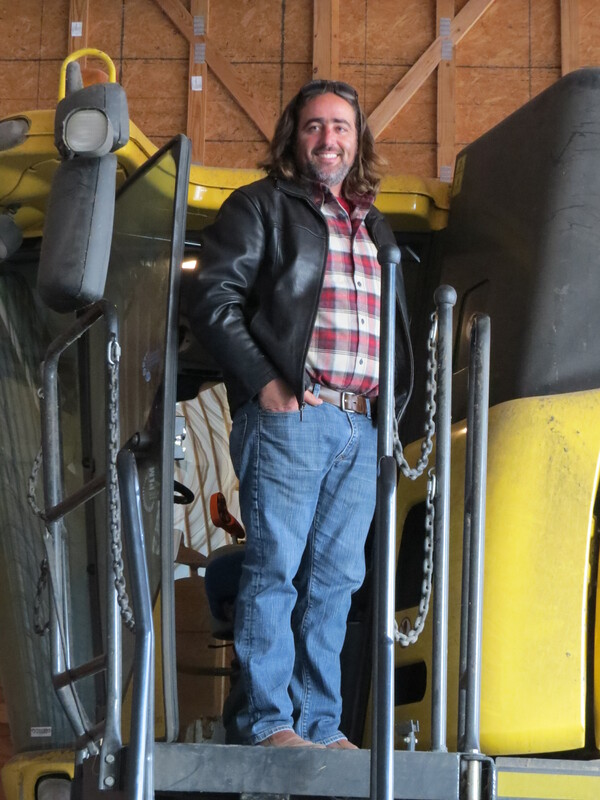 I know all about milking and feeding cows, bottle feeding baby calves, scraping the barnyard, computer monitoring and all the other too many to name chores on a farm. 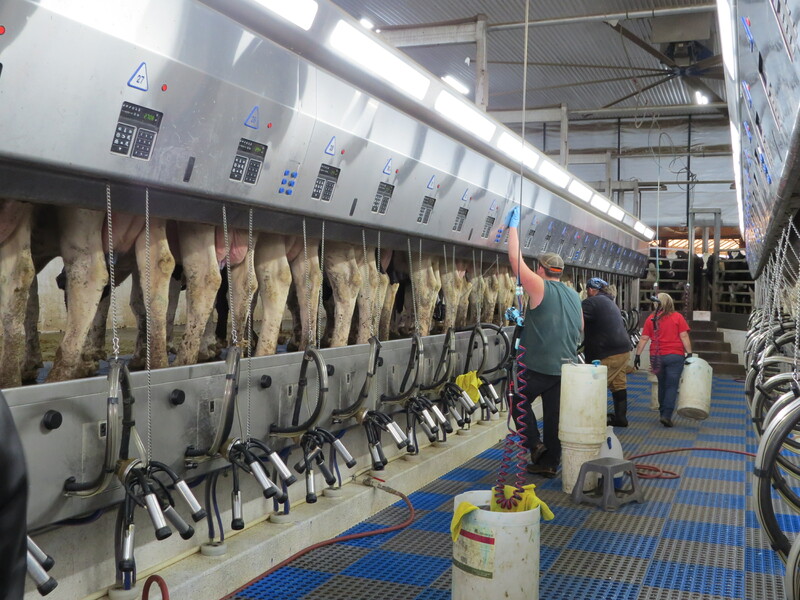 And yet I was absolutely stunned, fascinated and amazed at the advances in technology and the vast management requirements for such a large dairy. 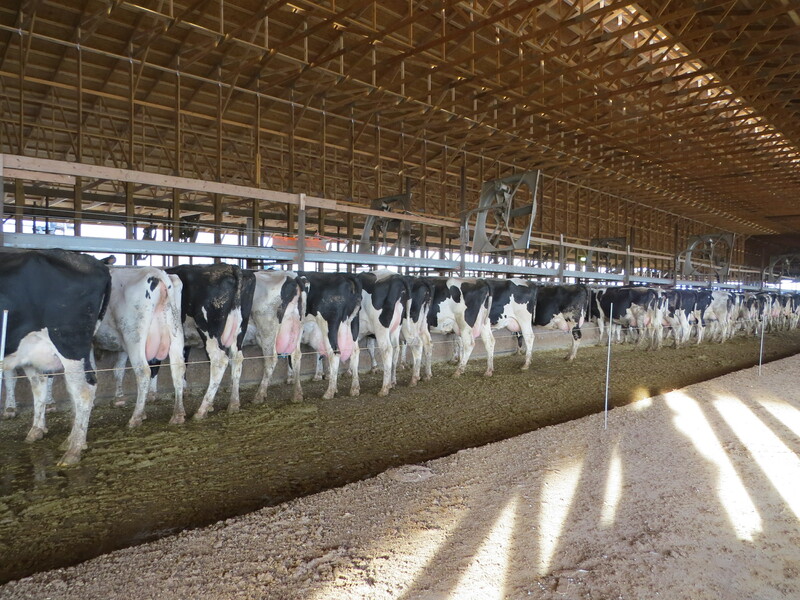 The most Gene ever milked was about 100 cows in a double four herringbone parlor which was “modern” in our time. We went out of the dairy business in the mid-nineties. Just a few pictures from our day. 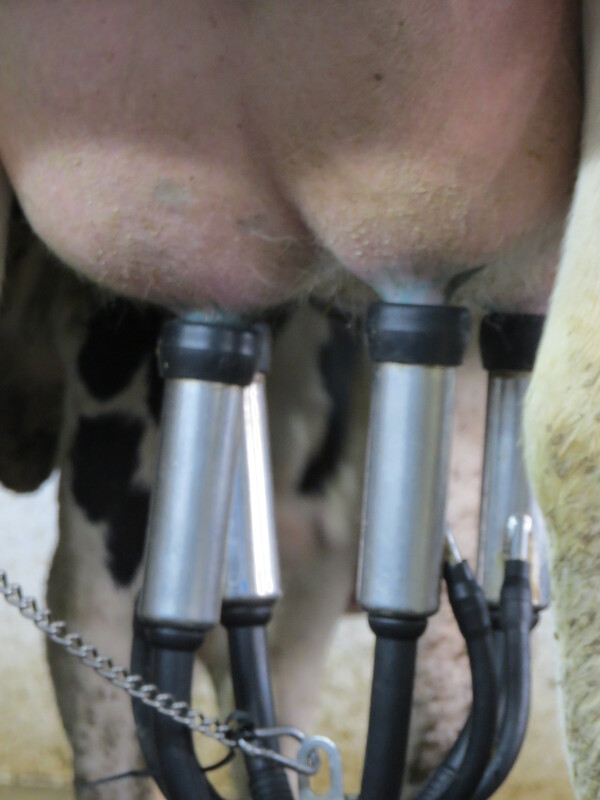 A double-24 which means they milk 48 at a time. If I remember correctly, Gerald said it takes three persons about 1-1/2 hours. They milk three times a day. This is the backside of the previous picture. 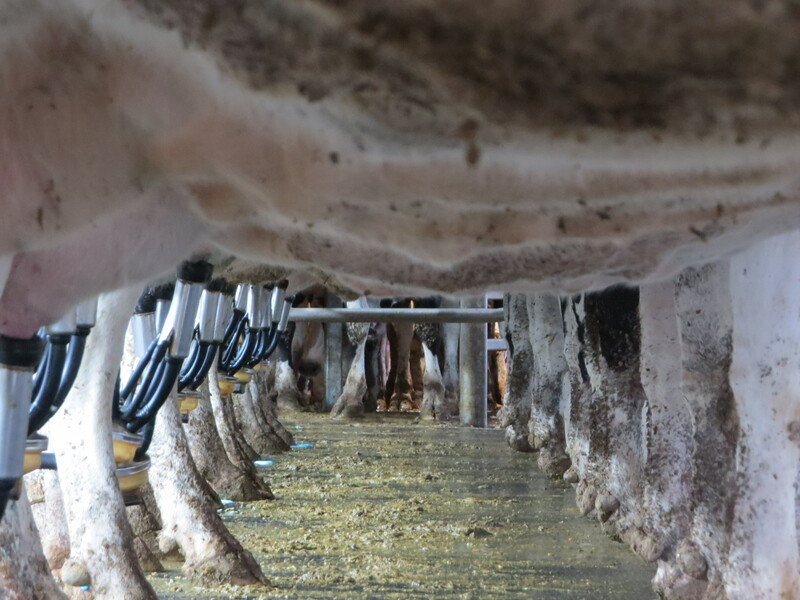 A neat view underneath the cows being milked. 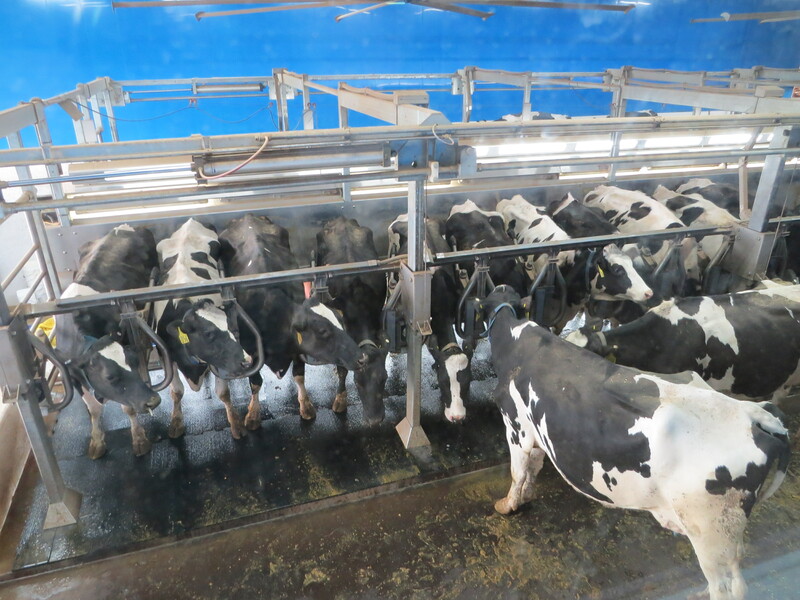 The cows and facilities were very clean. 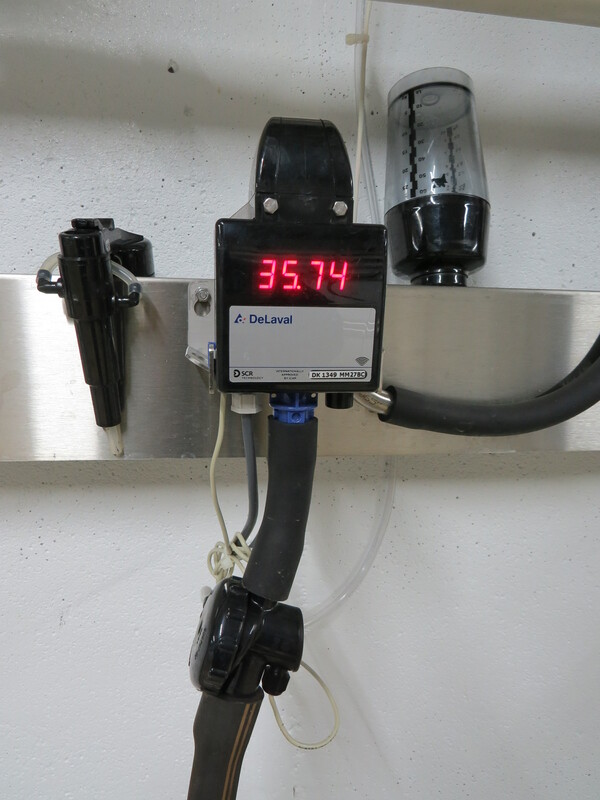 Milking meters record the amount of milk each cow gives and the information is sent to an onsite computer. Each cow wears a pedometer that records their steps. 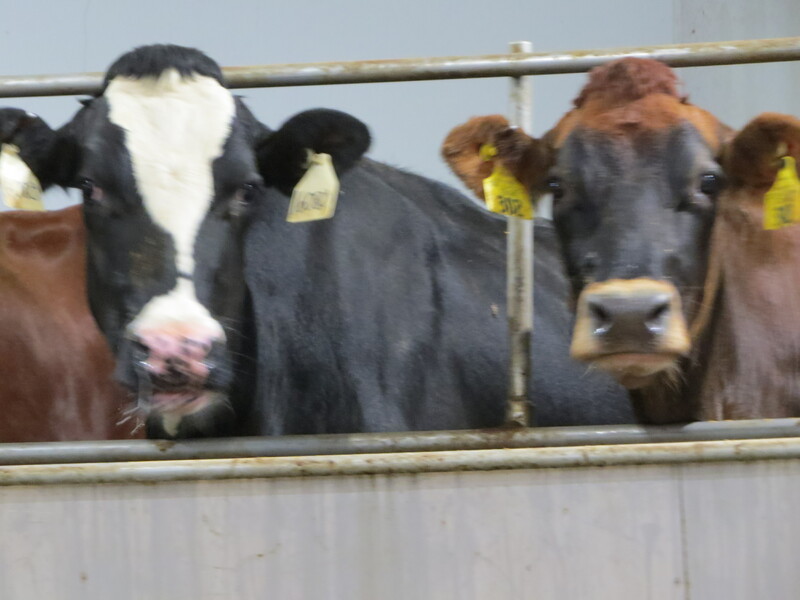 Increased activity signifies the cow is in heat and sends the information to a computer which alerts them that she is ready to be bred. 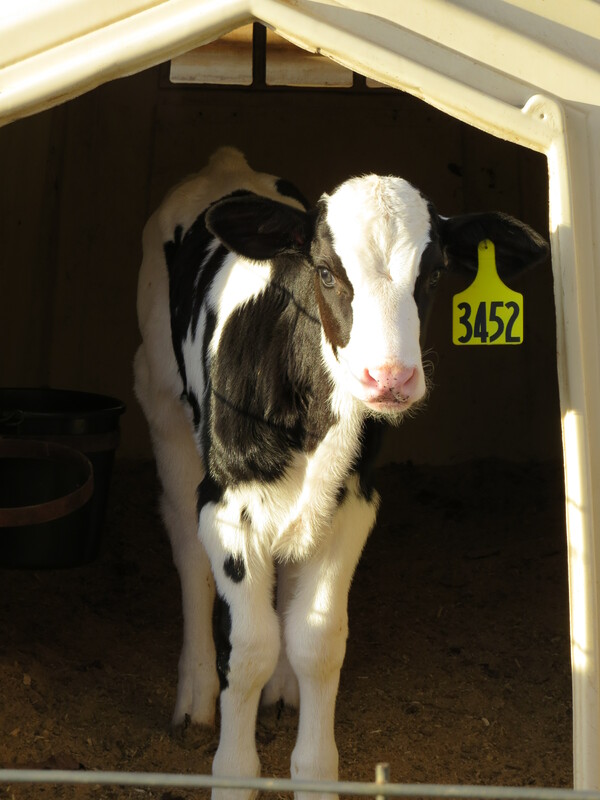 Decreased activity can mean a cow is sick or injured. Cows have access to pastures when the weather permits. 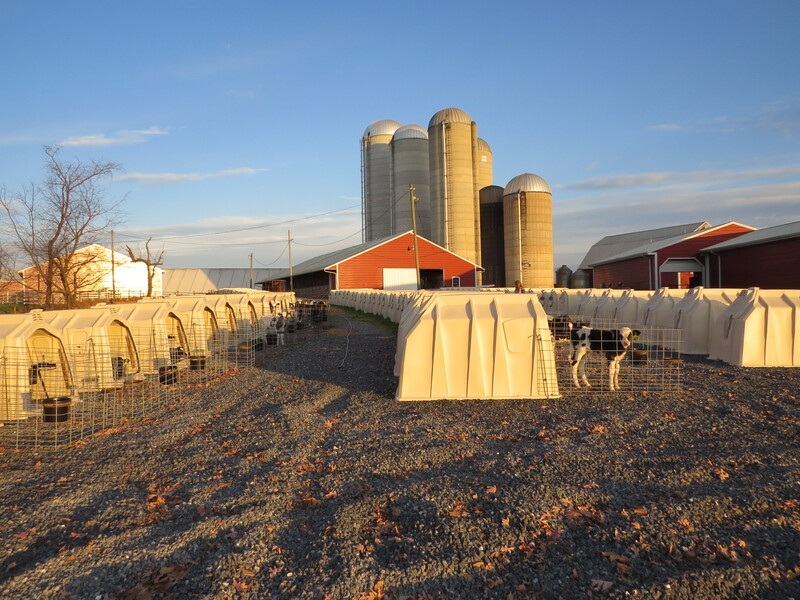 The cows were very contented, chewing their cud and enjoying the warm sunshine, all within view of the majestic Blue Ridge Mountains. 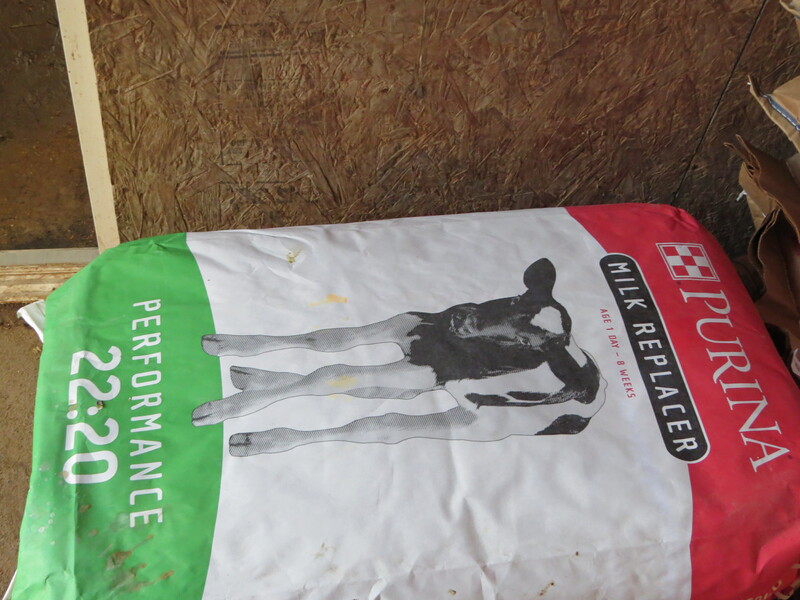 We were especially pleased to see they feed Purina Milk Replacer! 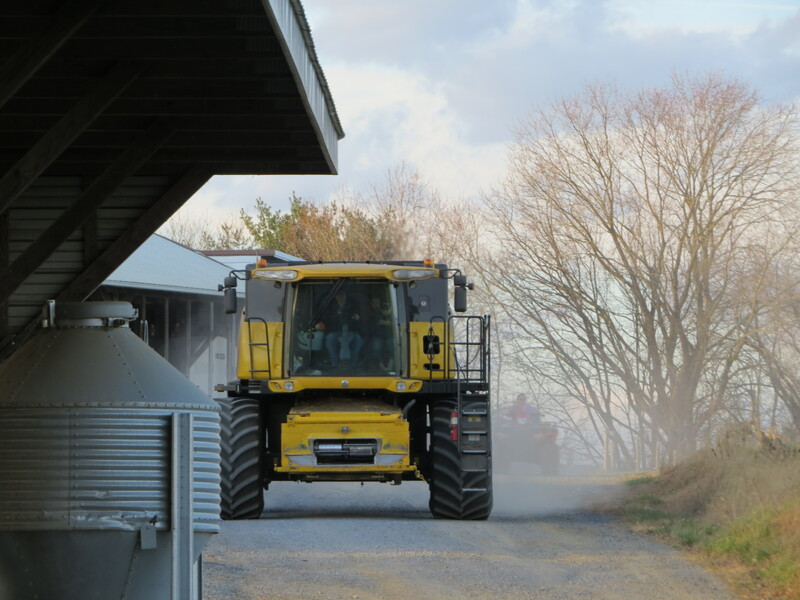 Combine coming in from harvesting soybeans. 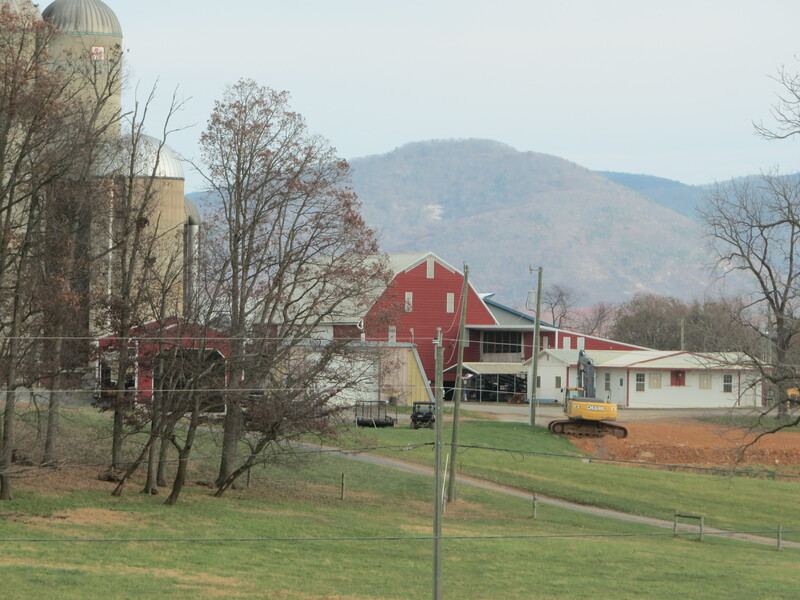 Anita took us down the road about three miles to the second largest dairy in Virginia, Stoney Run Farm. 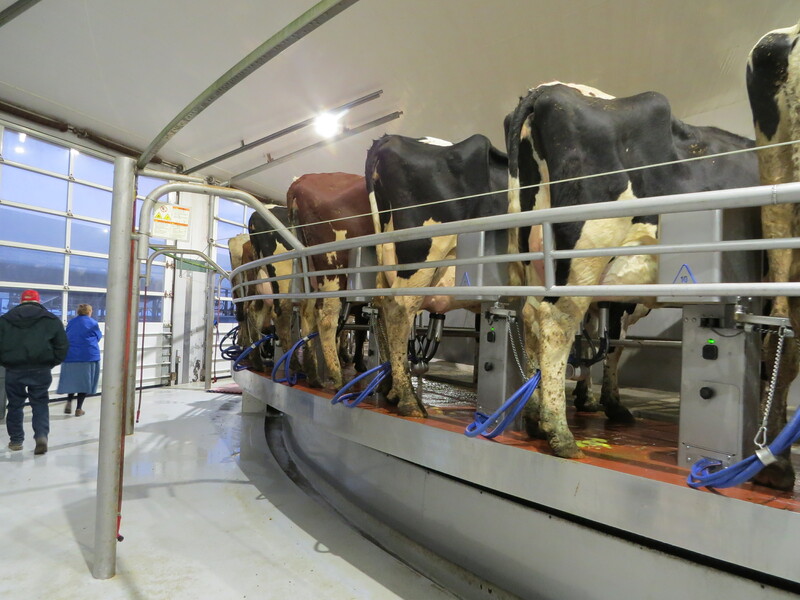 They milk 2400 cows on a carousel, stopping only long enough each day to clean and disinfect the facility. Incredible. Here again the dairy was very clean and the cows were very contented. 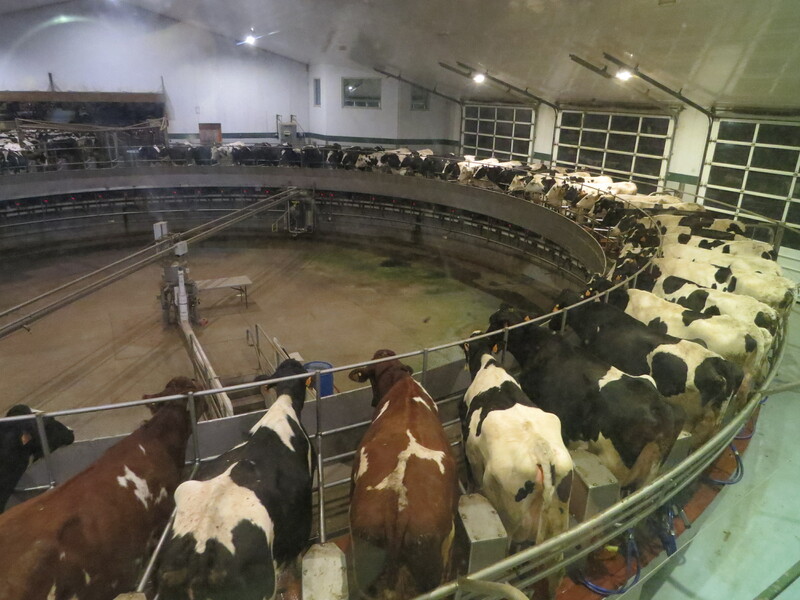 The cows get on this ride without being forced. In fact, they were standing in line, on their own, and as soon as a cow got off, the next one was ready, anxious and pushing to get on. Very few cows dropped manure on the ride which was amazing to us. 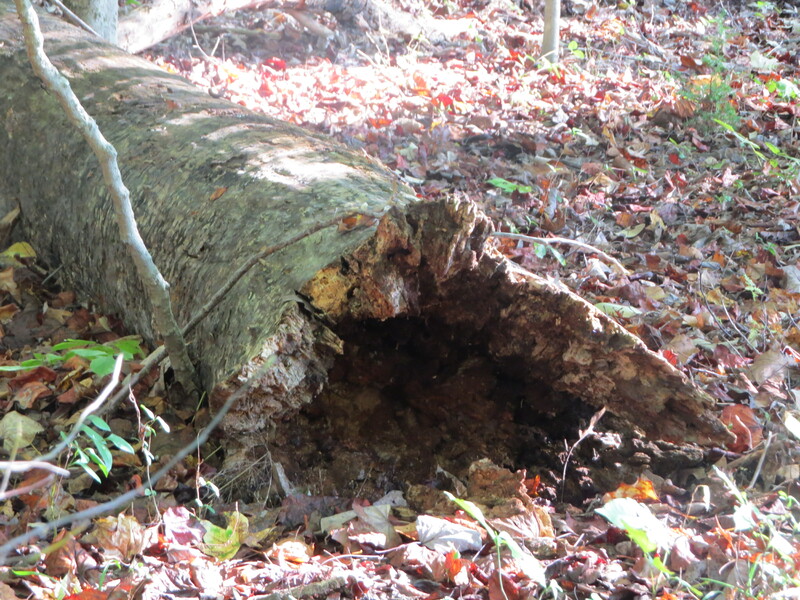 Those of us who know cows, know how often they drop their piles of manure!! They just chewed their cud, looked around and smiled as they enjoyed the ride. 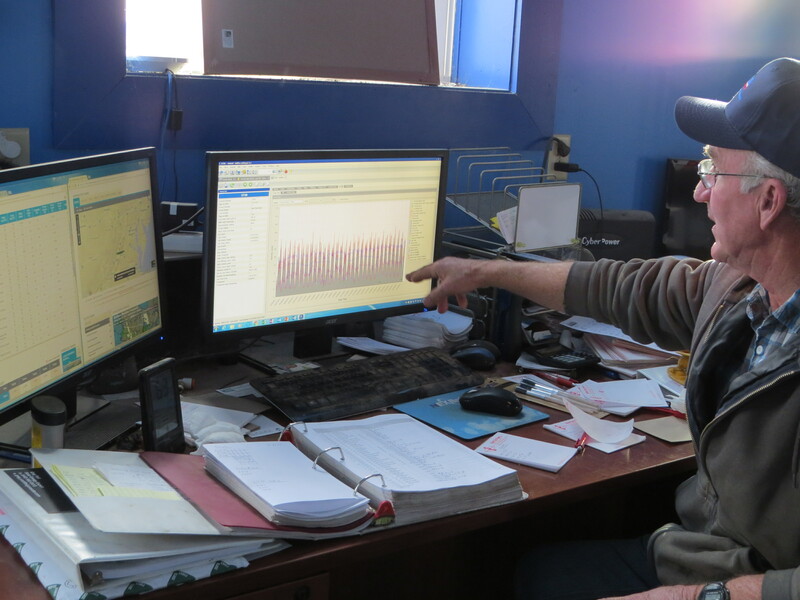 The technology used in farming is amazing and the management skills and capital needed, staggering. 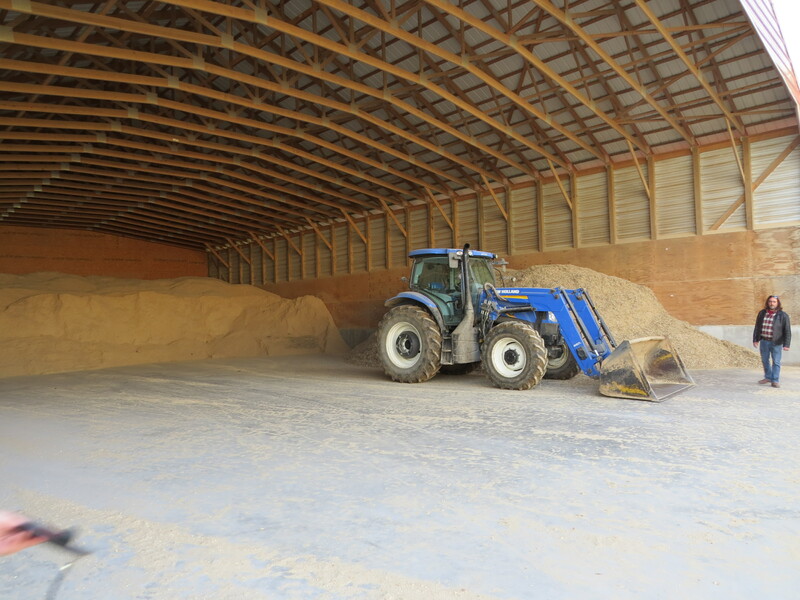 Most people have no idea what it takes for food to get from the farm to the table. If you ever get a chance to visit a farm, do so. I suspect it will increase your admiration for our hardworking men and women who love their animals and occupation with a passion. 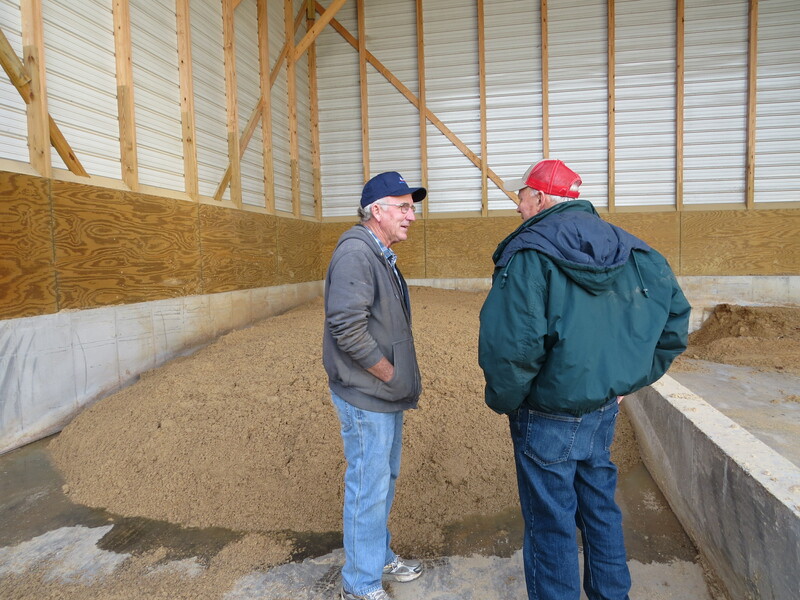 The Heatwoles’ are a true working farm with three generations; grandparents, parents and grandkids all working together and loving it. 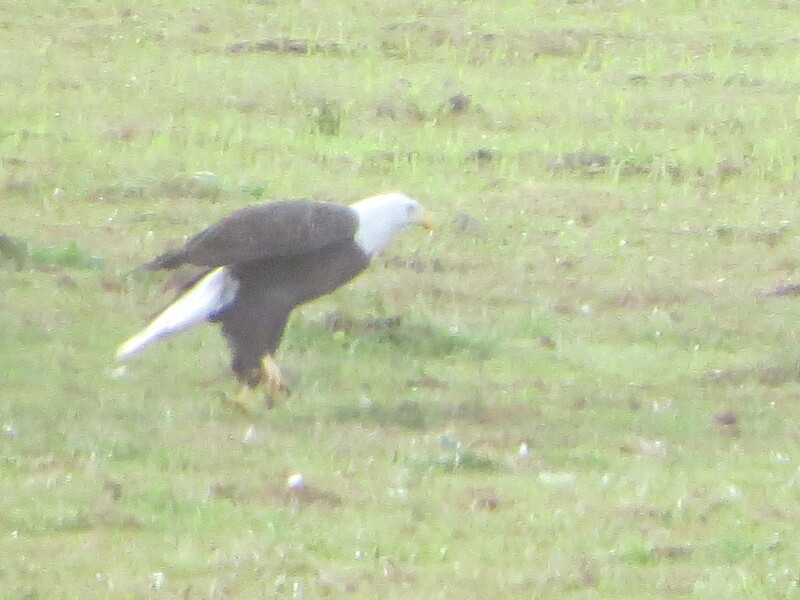 The last two days Gene has been seeing a pair of bald eagles flying around the farm. This is so exciting and we are hoping that they are calling this home. 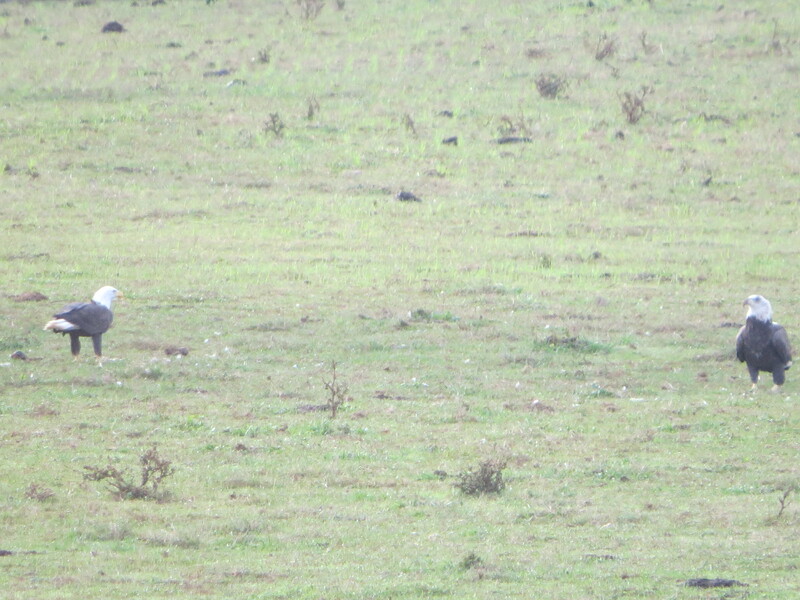 Yesterday afternoon Gene called me as he was feeding cows and said he was pretty sure he was seeing Bald Eagles. 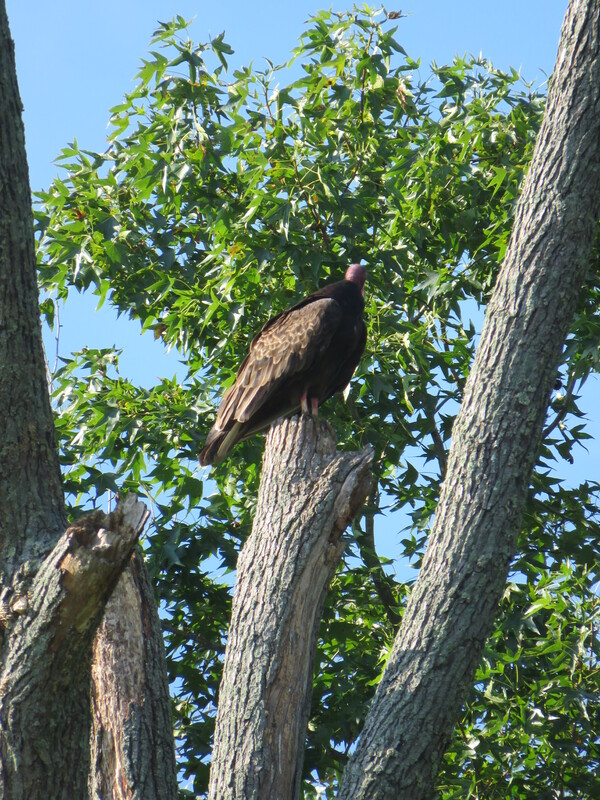 They were perched in a tree down along the woods and wondered if I could see them from the house. I couldn’t, so I grabbed my shoes, coat and camera and drove the car down the driveway towards “the back 40” to get a closer view. 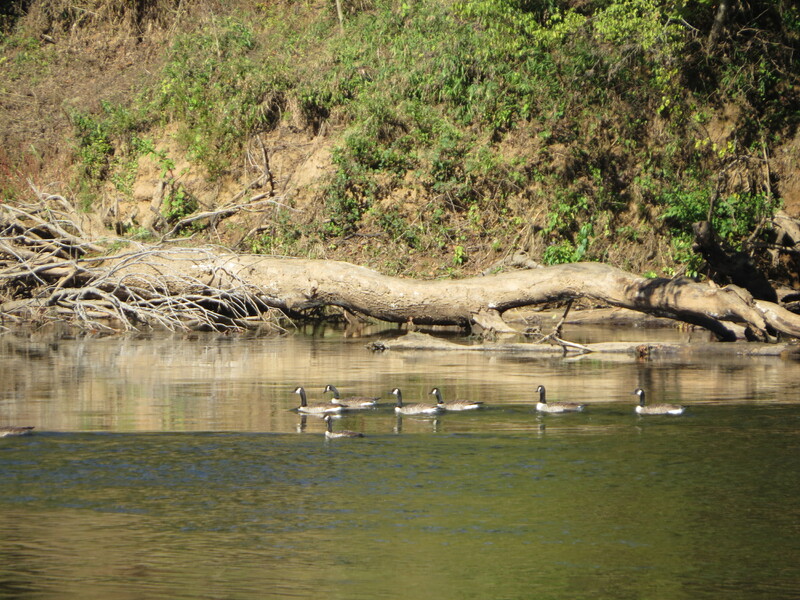 By the time I got there, they had circled and were gone. This morning while he was feeding the cows he spied them again. 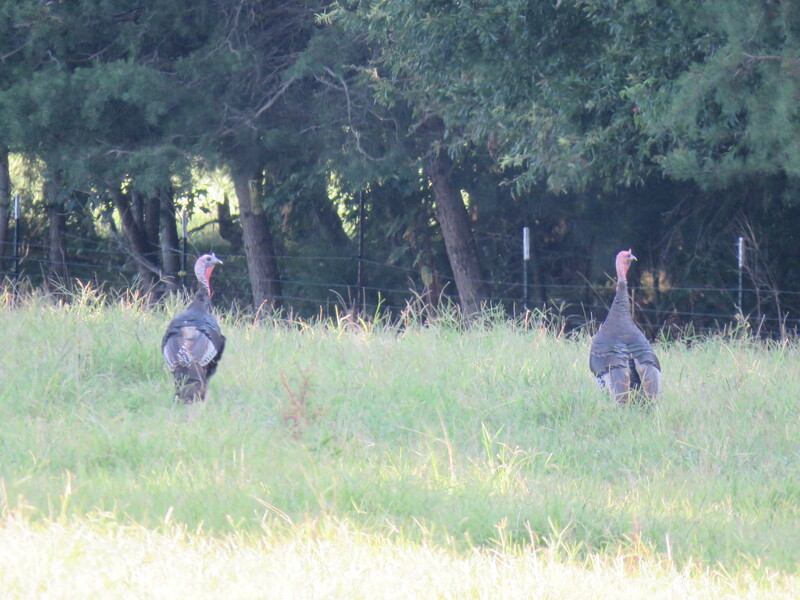 This time they were in the field directly behind the house, about halfway to the feed bunk. I was able to pull them in with my camera and get some pictures. 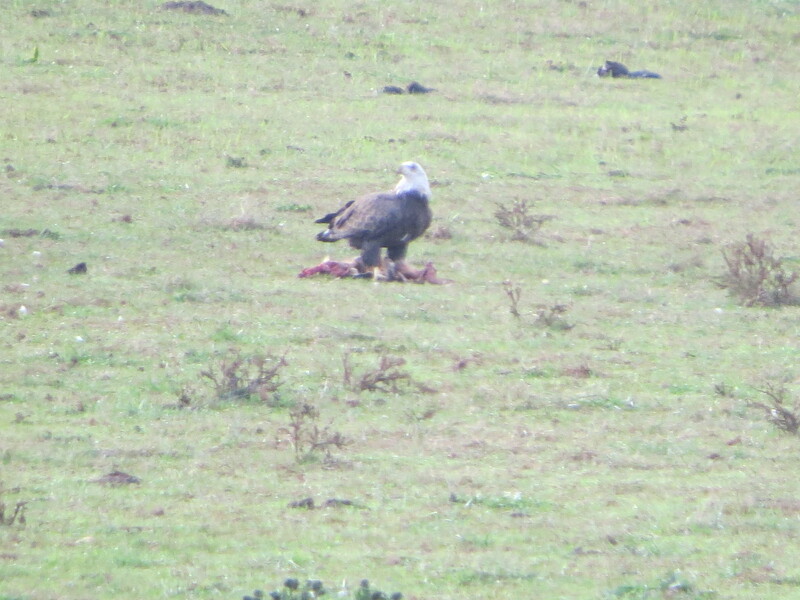 I discovered they were eating something dead. It looked like a small calf or deer. Since what they were eating was already dead and there was nothing he could do about that, he let them be while he got ready for church. Before leaving for church, he drove down to see what it was. It was a Red Fox! We wonder if they nabbed him trying to cross the field or if he died as he was crossing. I don’t know if there is a down side to having them hanging around but right now if feels very special. 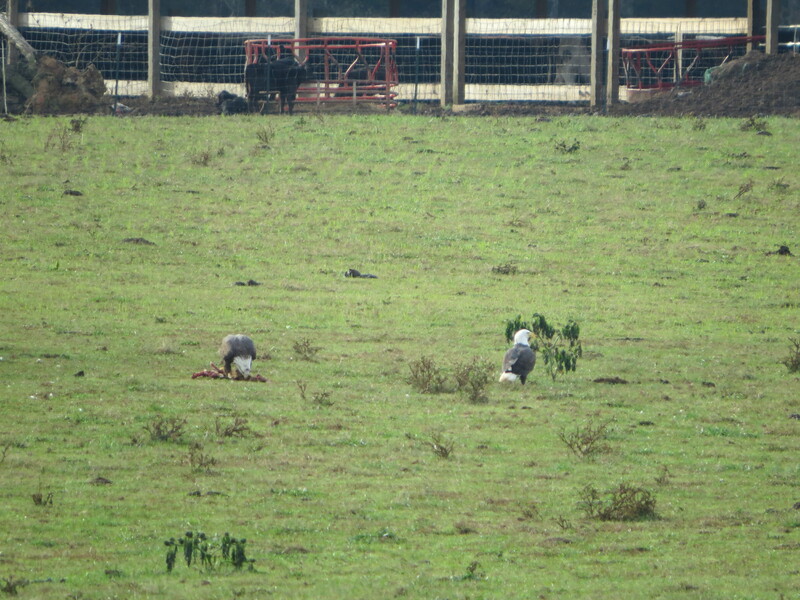 I hope I can get some clearer and closer pictures of these majestic birds. 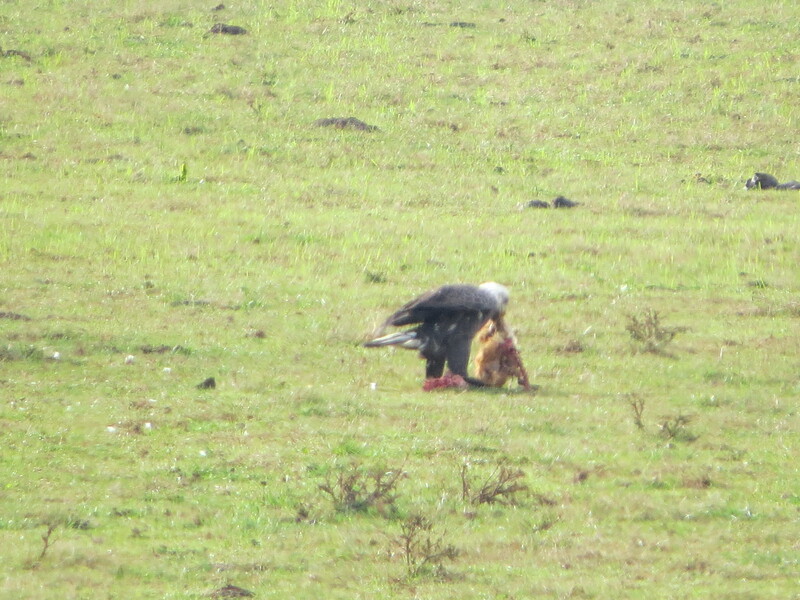 (This was a shot of about 500 ft. which is amazing for a camera). 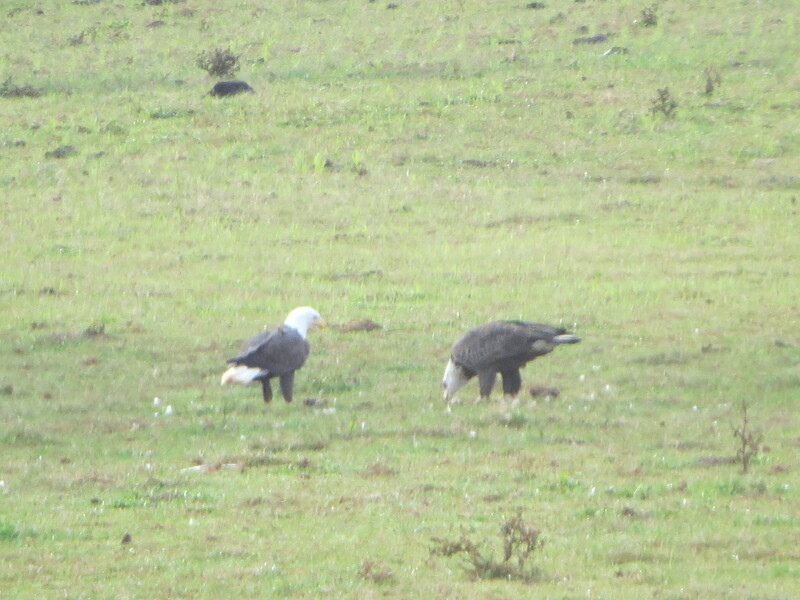 A google search revealed some interesting facts on Bald Eagles. They nest in the winter. 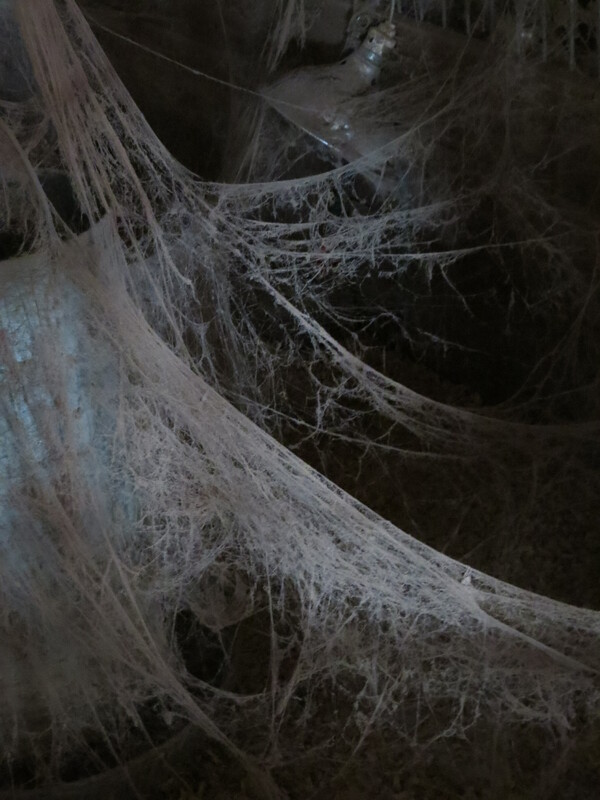 Their nest can be 5-9 feet wide and 15 feet deep weighing up to 2 tons! Wow. We should be able to spot that nest in a tree if they choose to call this home. 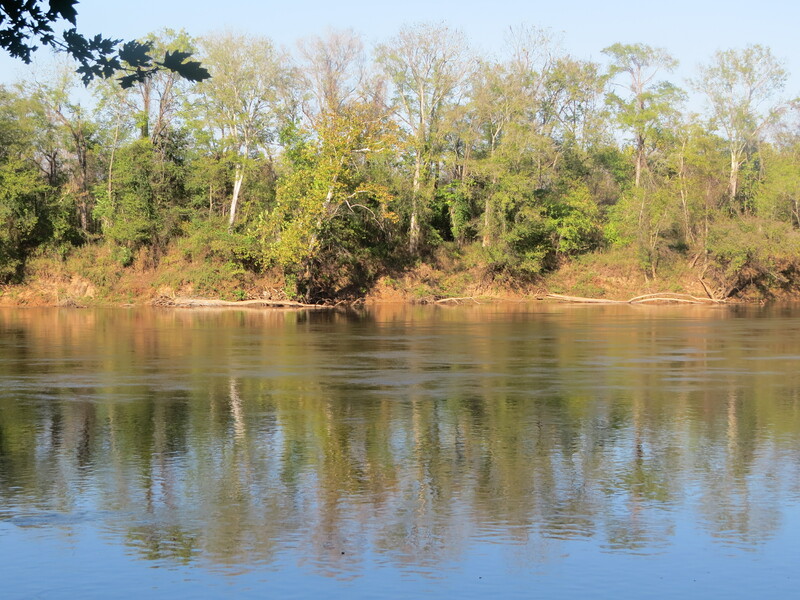 11 Interesting facts on Bald Eagles in Virginia. 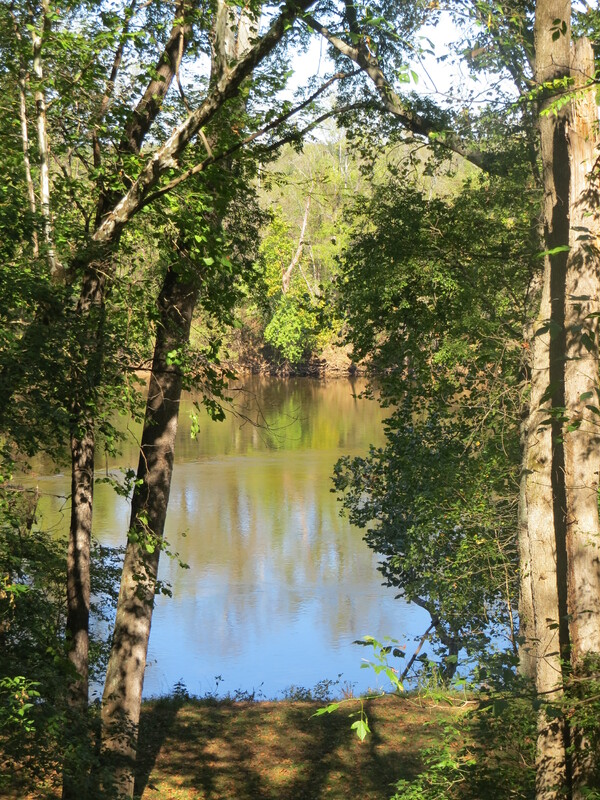 I love the beauty of fall; the smell of wood smoke in the air, the crisp, damp evening air, geese honking as they fly in V formation overhead, swarms of starlings flying in a haphazard but well orchestrated pattern, the musty smell of colorful, falling leaves, beautiful spider webs that pop up overnight, colorful sunsets, and the list could go on and on. 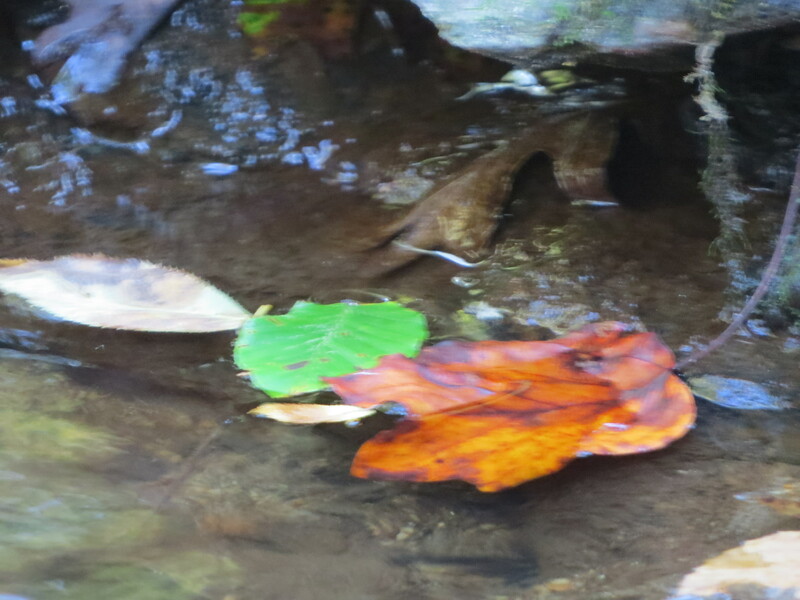 This post is just some pictures I have taken, trying to catch autumn’s beauty even though the leaves are not as colorful this year. 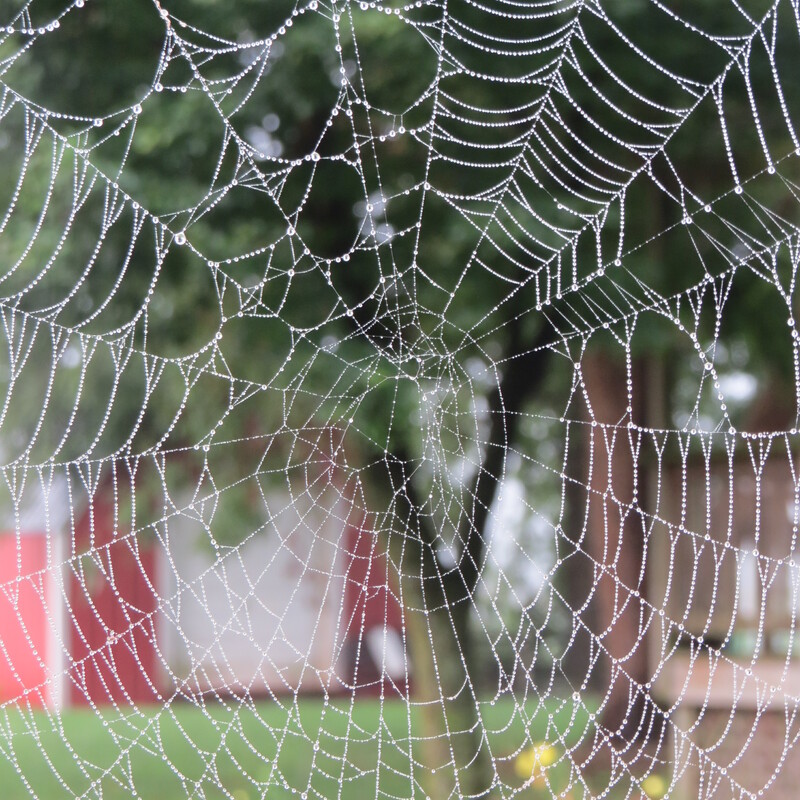 Morning dew on an overnight spider web built on my golf cart. 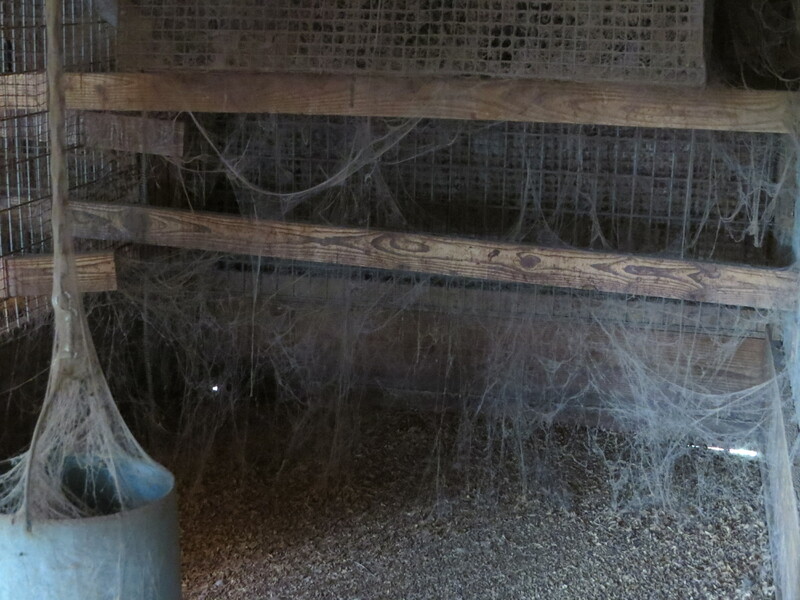 Spider webs in an unused portion of the chicken house. 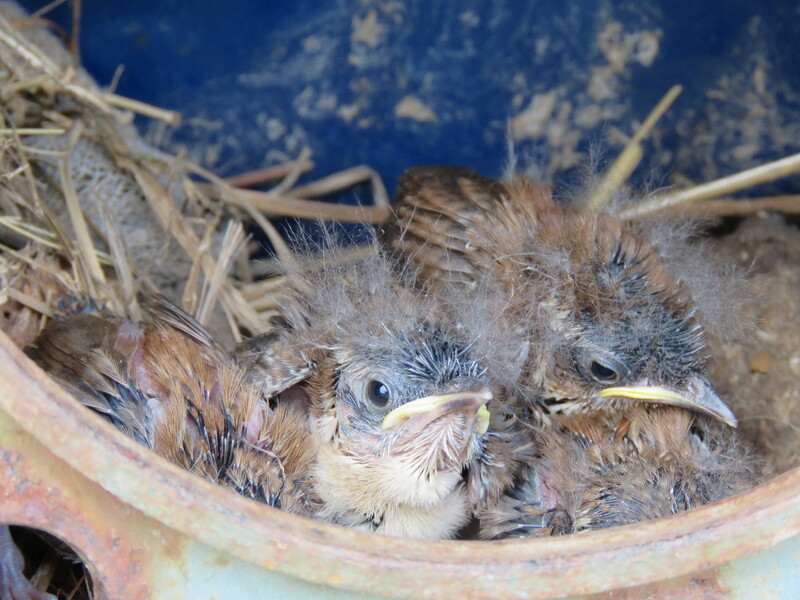 They formed almost overnight! 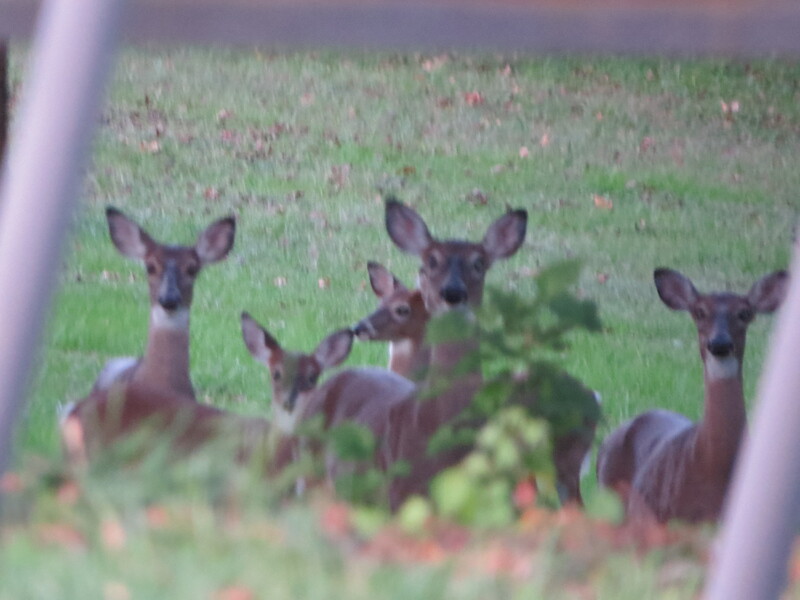 Deer 50 feet from the house. 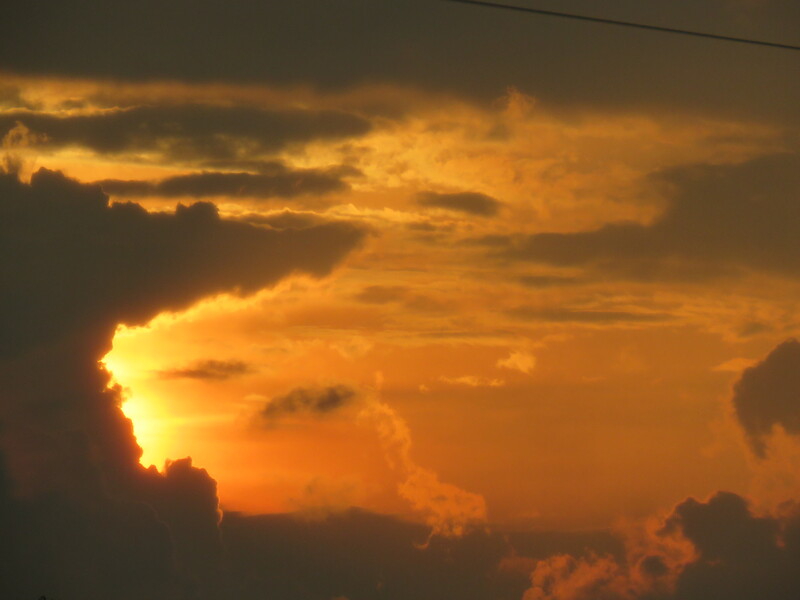 Sunrise from my kitchen window. 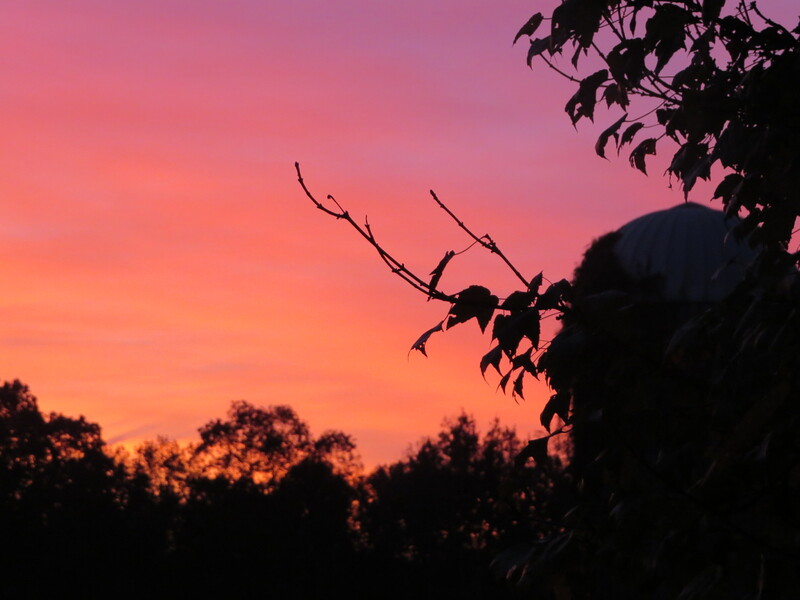 Sunset from my front door. Years ago I ordered a dogwood tree, thinking I was getting our state tree. It turned out to be similar but different. In the spring the flowers have a greenish hue to them and in the fall the tree is loaded with soft red balls. 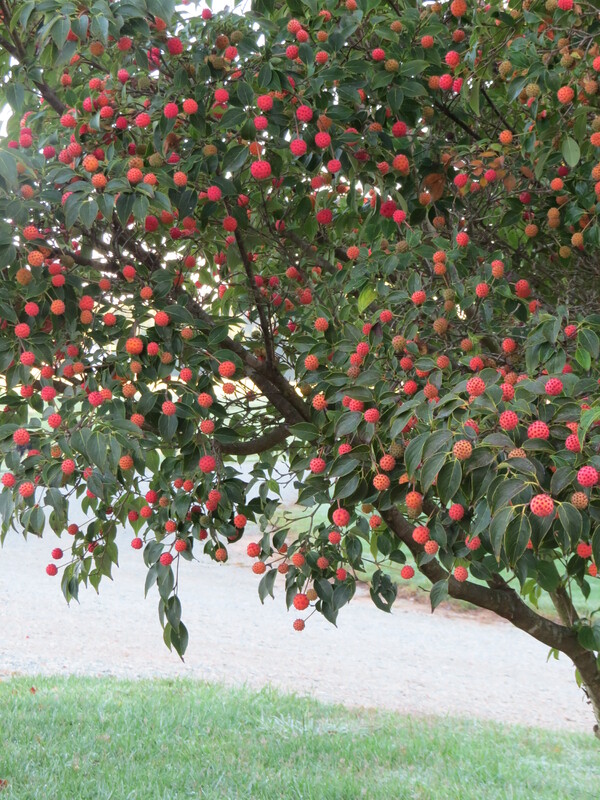 I have recently discovered it is the Kousa Dogwood and the fruit is edible!!! I have not tried it but I do enjoy the uniqueness of it’s beauty. 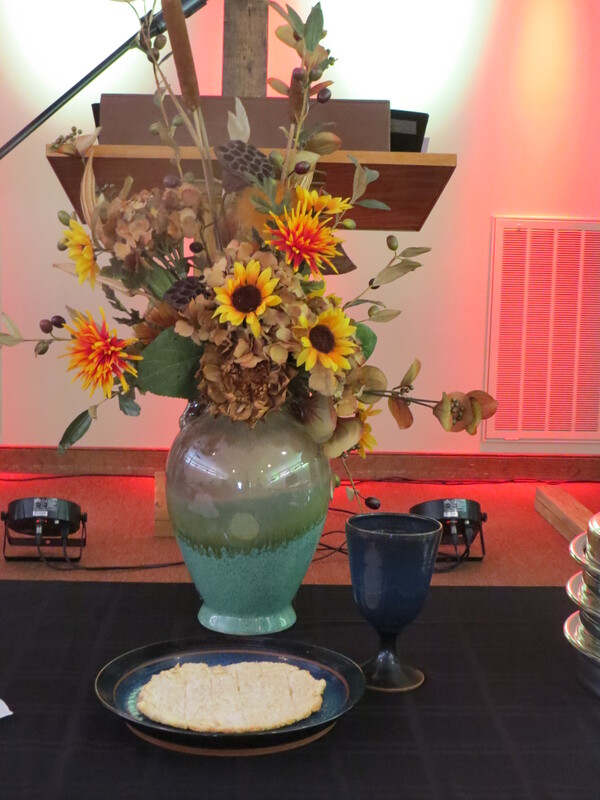 Fall decorations and communion service at church.